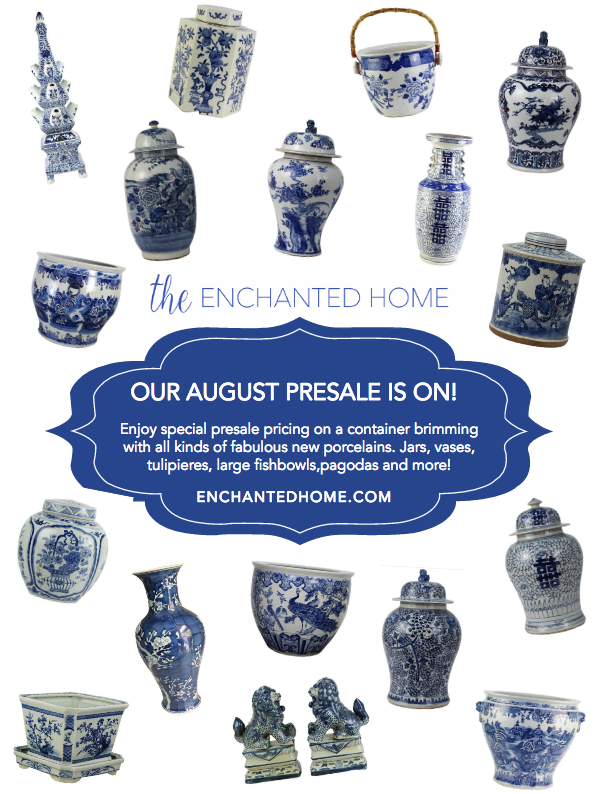 The August porcelain presale is on and a ginger jar giveaway! 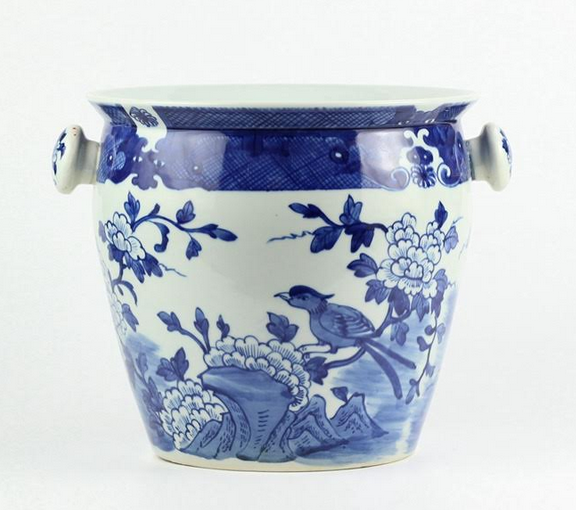 Our final porcelain container for the summer is due in around August 18th, in under two weeks! 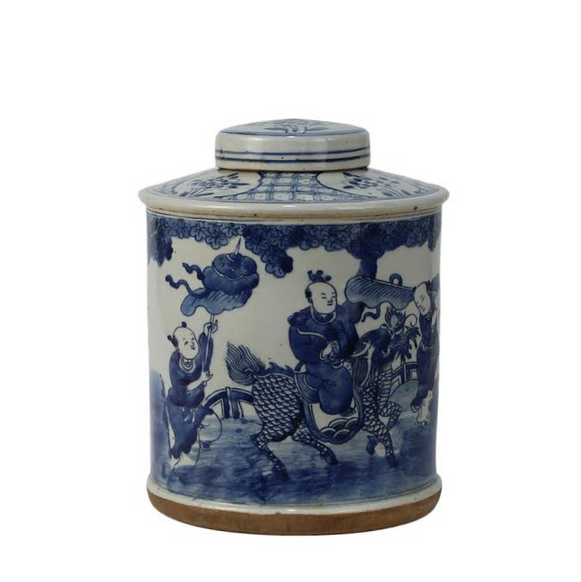 If there is a theme for this particular container, its all about NEW ITEMS….tons of beautiful new things that I am very excited about. The extra large fishbowls are finally completed (gorgeous) and I am happy to report, part of this container, plus a whole assortment of new beauties. And of course the return of things that we are always sold out of like tulipieres and foo dogs, we doubled up on those items to assure we are well stocked going into the fall. 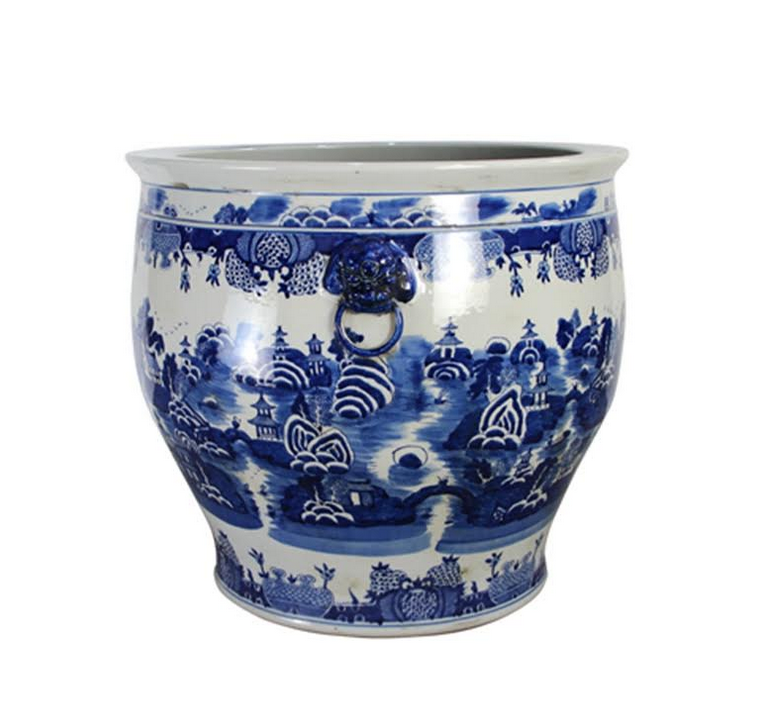 This is always the best time to buy the porcelains as they are offered at their lowest prices and you are guaranteed to get a particular item as often things become sold out when they arrive. ITEM 1. NEW! Gorgeous new style jumbo fishbowl. Just love this and will absolutely need one or two for my own home. 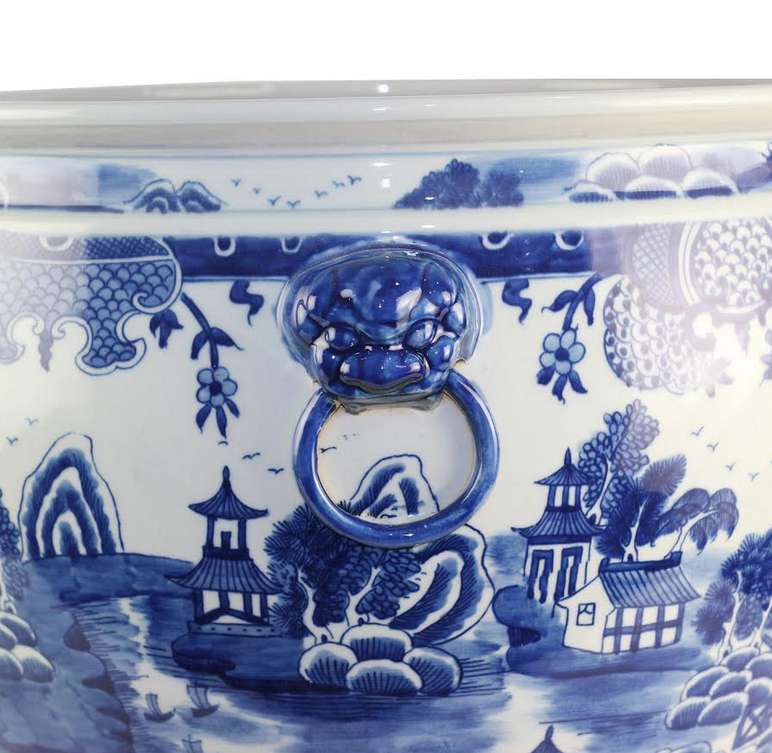 Beautiful village scene fishbowl with elegant lion head rings on either side. Perfect for indoors or out, filled with a boxwood ball or topiary of some sort. Measures 22″ x 23.5″ x 23.5″ If you know the prices of these extra large fishbowls, you will see these are way less than a third of what most sell for. ITEM 3 NEW! 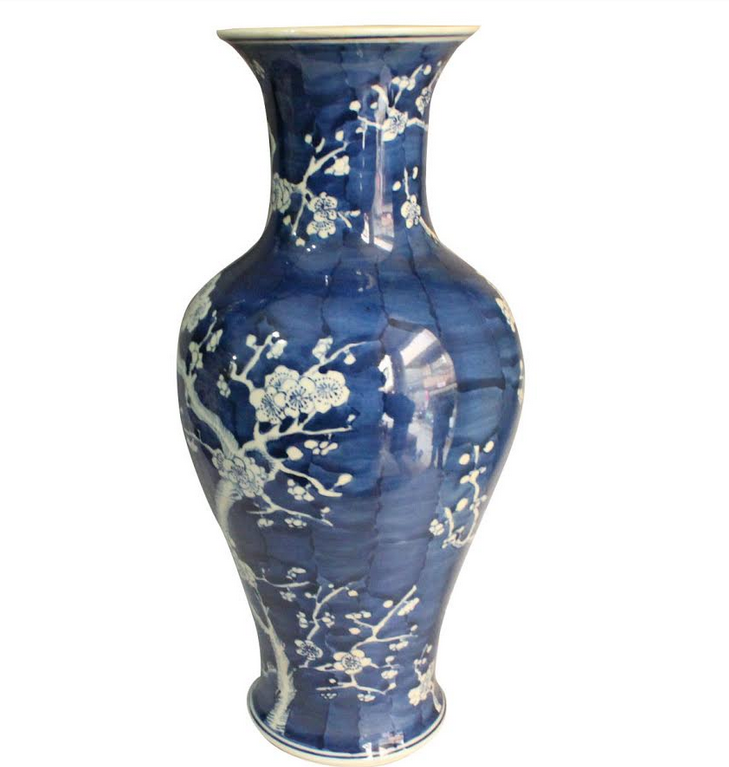 Stunning new paneled large vase, isn’t this gorgeous! 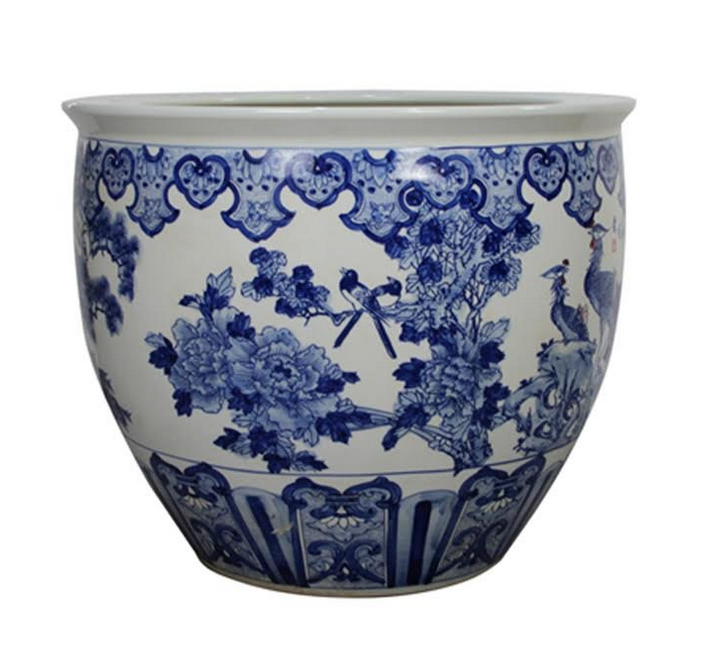 I can see big branches or cherry blossoms in this, how amazing would a pair be on a mantle! 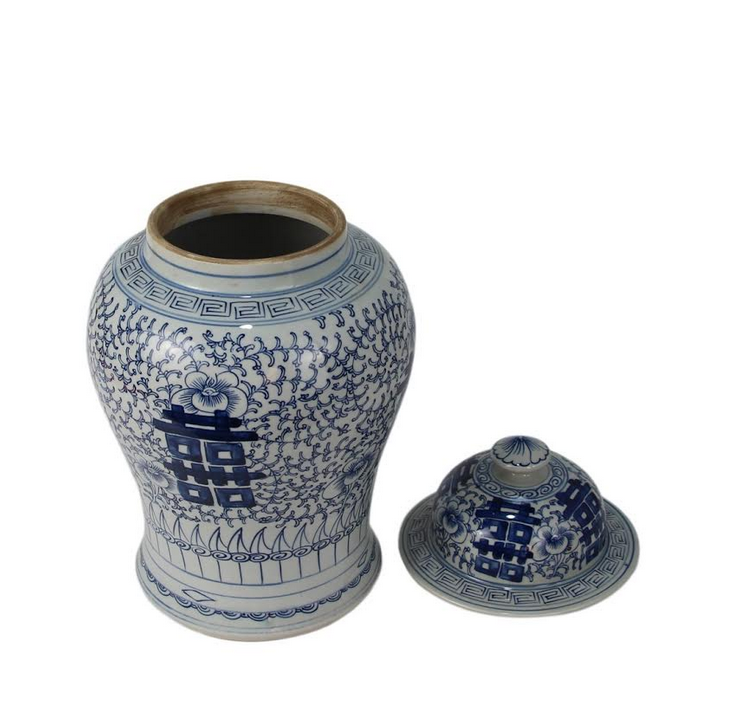 Measures 22″ tall by 7″ at the widest. $120.00 OR. a pair for $230.00! ITEM 4 NEW. The fabulous jumbo pheasant fishbowl is back! Finally…..these are beyond gorgeous. I own four, 2 are kept outside on my patio (year round they have survived arctic brutal NY winters) and 2 are indoors with palm trees. These are truly magnificent and handpainted on the entire planter, they go for upwards of $1500 and more in the few places that sell them. This beauty which measures 24″ x 24″ x 20″ is sure to beautify any space where it is used. If you know the prices of these extra large fishbowls, you will see these are way less than a third of what most sell for. ITEM 7. Finally getting these back! Talk about statement pieces, these are the ultimate. These original style tulipieres are so incredibly beautiful. I own two and love nothing more than finding a reason to fill them with flowers, they make such an incredible vignette. I use mine year round and use seasonal flowers to change up the look. ITEM 9. Our fabulous best selling new porcelain wine cooler/ice bucket with removable bamboo handle is back. This is one of my new favorite pieces, looks amazing filled with up to 3 bottles of wine/sparkling water. ITEM 14 NEW! Another stunning large fishbowl 17″ x 17″ x 18″ This large bowl is beautifully handpainted with an elegant village scene. This size makes it ideal for indoor use as well as outdoors on a patio or by a front door. If you know the prices of these extra large fishbowls, you will see these are way less than a third of what most sell for. ITEM 15 NEW! 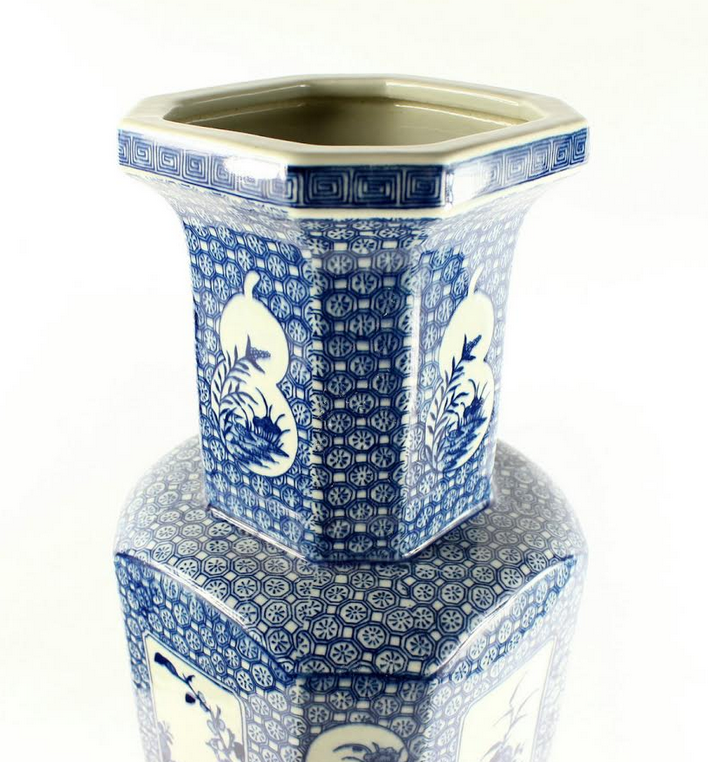 Fabulous figurine tea jar with trellis detailed top. I love this pieces and would love a pair even more:) Perfect size, gorgeous scenery and love the lightly antiqued finish as well. Measures 10″ x 8″ x 8″. 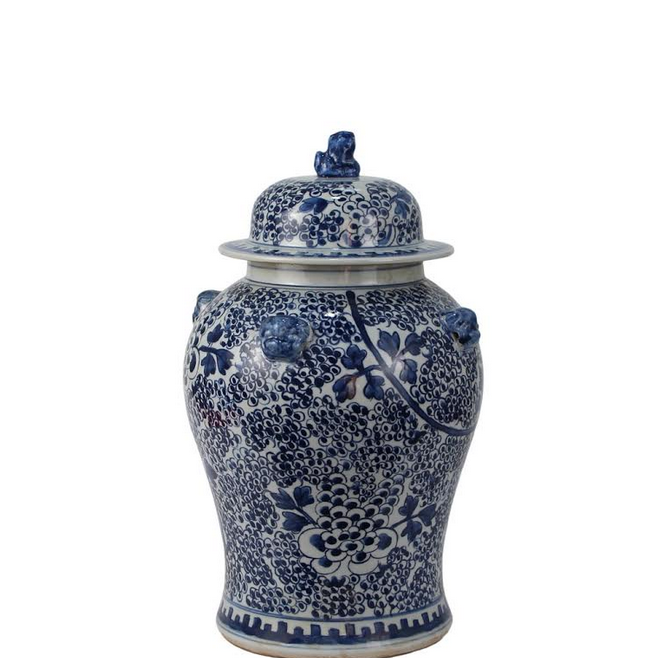 One lucky winner is going to win this wonderful and super decorative flat top jar. 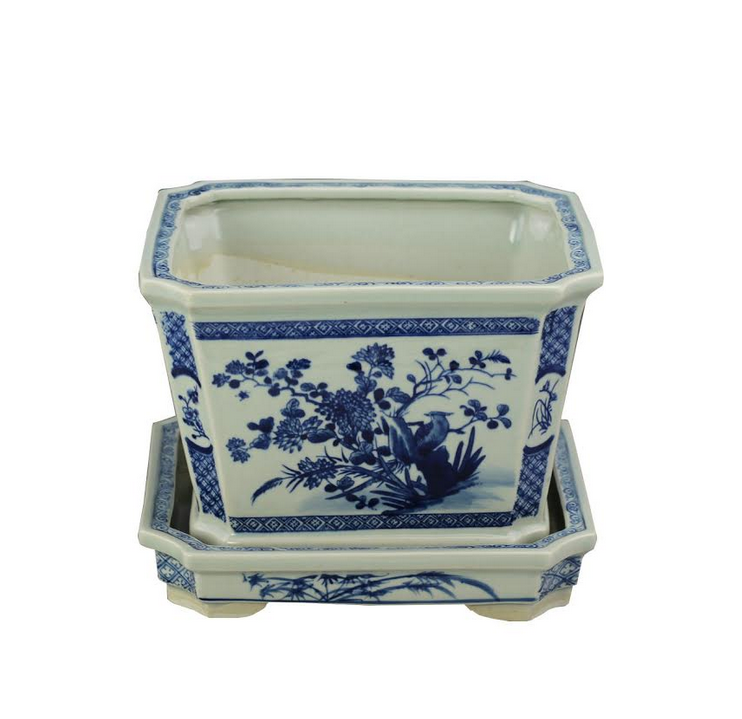 Just leave a comment on this post telling us your most favorite piece from this new container brimming with porcelain pretties. I will announce a winner on Sunday. Be sure to stop by and see if you won on Sunday! 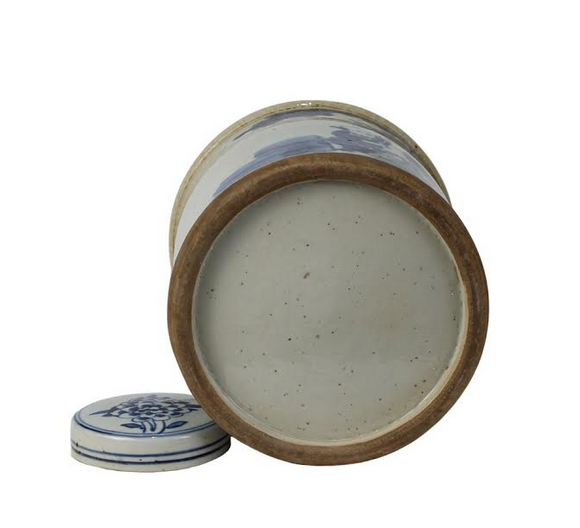 Thanks for stopping by, it is always a good day when we hold a porcelain container sale, gets my mind racing about all the new pretty possibilities and combinations! Lots to love here, and getting in new items is the icing on an already sweet cake:) Wishing you a fantastic day, until next time……. 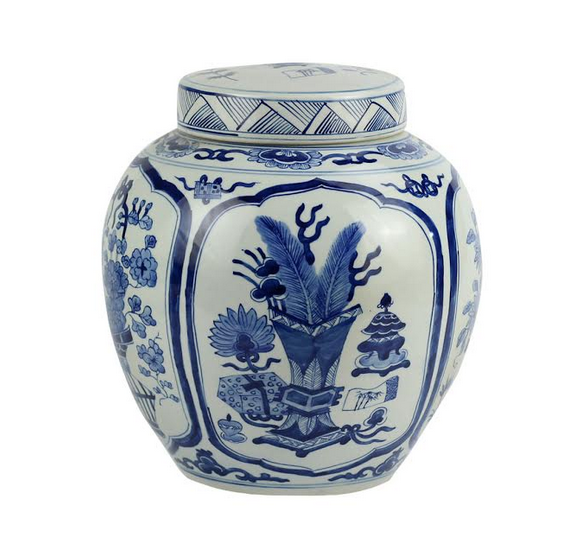 The new ginger jar is just beautiful, the pattern so delicate, just lovely! Item #18 – ornate, yet simple at the same time. I love the design over all the jar. Love item number 20. What else can I say but me, me, pick me. What beautiful pieces you are offering. My favorite piece is Item No. 20. 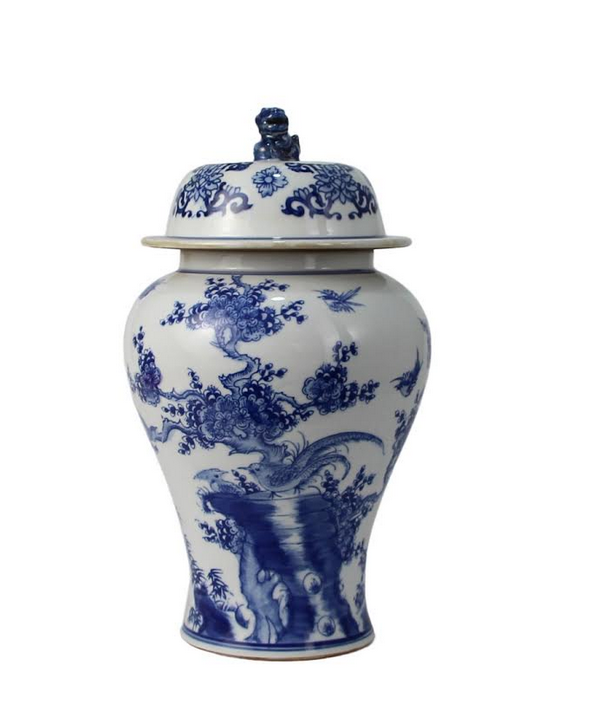 I love the ginger jars, and this one has the cutest foo dog handle. It is so gorgeous, it would look stunning in my living room! Wow, the new large fishbowl are gorgeous!! Love the Foo dogs large and small. They just make me smile! I am going to have to order the small ones, been wanting these for way too long! Once again the blue and white is to swoon over for sure. 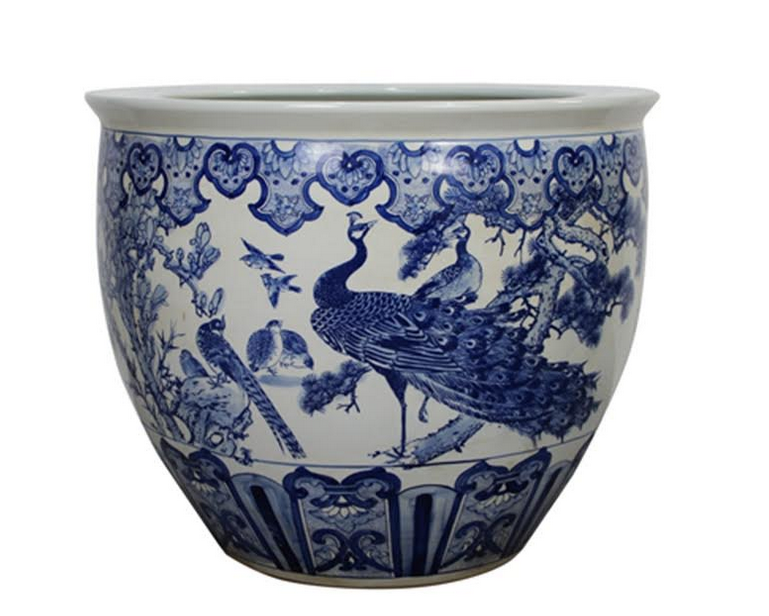 I love the “magnificent pheasant jar”, and always come back to look at the tulipieres! Beautiful porcelain as always! My favorite piece is Item #20, the mid sized ginger jar. Would look great in a vignette. So many lovelies to choose from. Swooning over the jumbo fish bowl – a timeless classic! 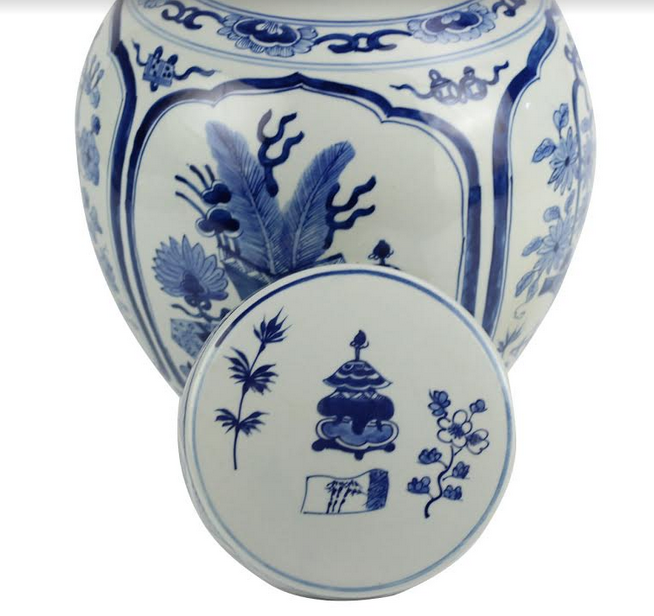 Item #21, pure artistry in blue and white!! Item#21 Pure artistry in Blur and White,love it. Love all your new pretties! 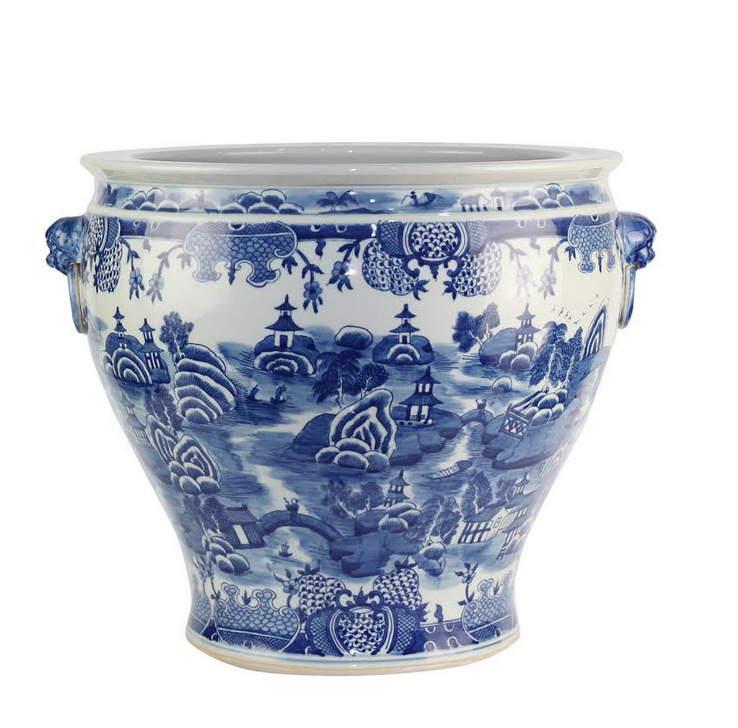 I have been looking for a blue and white ice bucket – thank you! They all take my breath away, but for me the best of the best is #14 – the large hand painted fishbowl – WOW!!!! I love it! 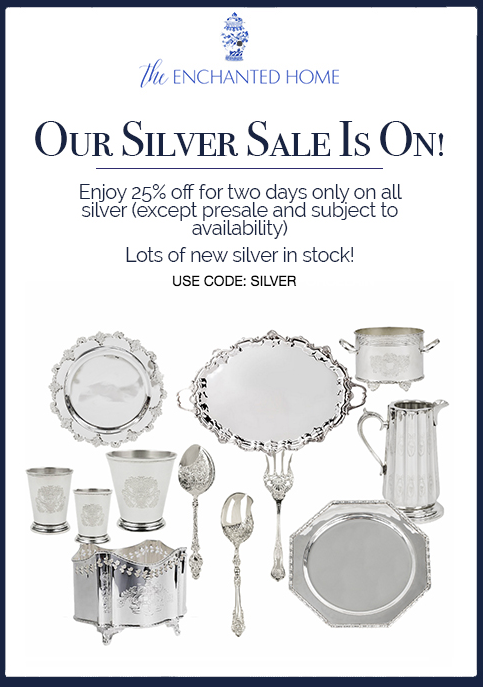 It’s so hard to narrow down a favorite because of all the beautiful pieces. I can picture the perfect spot for each of these in my home, but I am currently loving #18 for on my dining room buffet. . .although #4 would be just gorgeous on the porch! 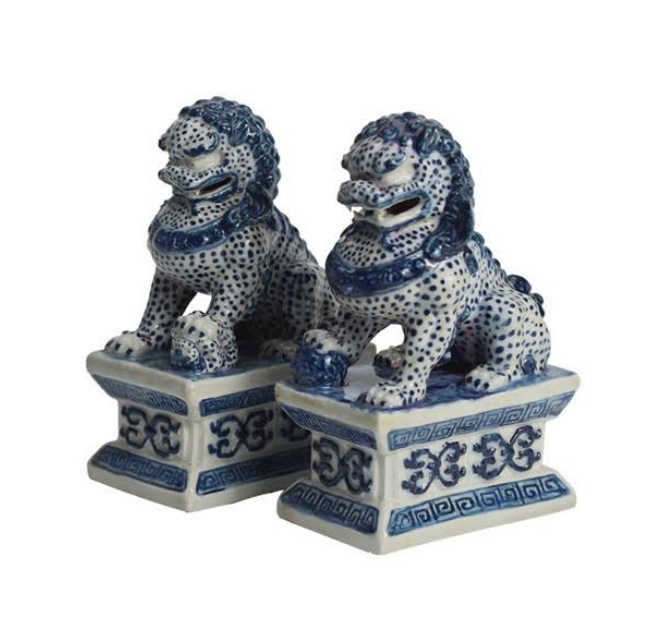 Love Item 8 foo dogs! Can see them on my mantle now! Dear Tina — Love everything! 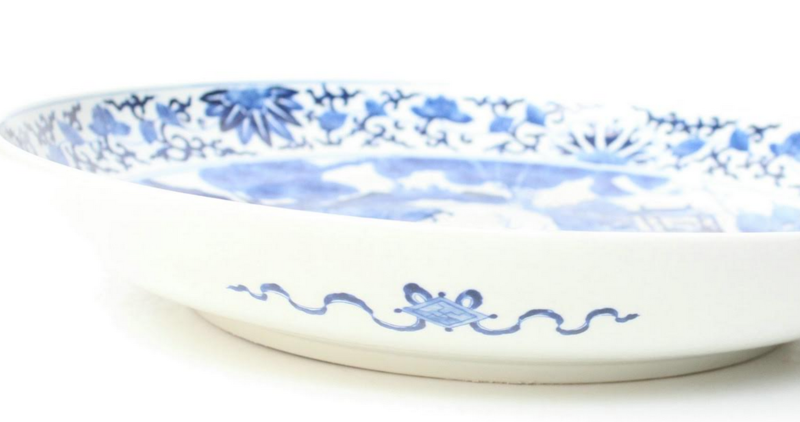 Such a beautiful porcelain collection! 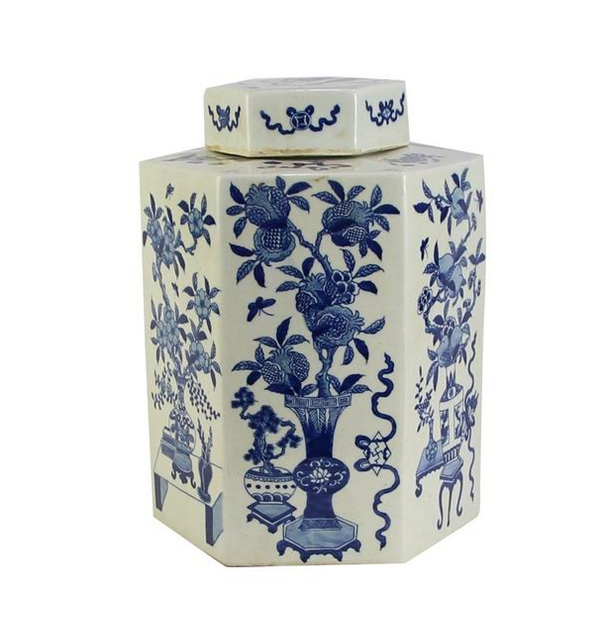 My favorite is the wine cooler / ice bucket because it would look lovely at a party, on the bar counter, or with other blue and white porcelain. Just ordered it and can’t wait to receive! Thank you! 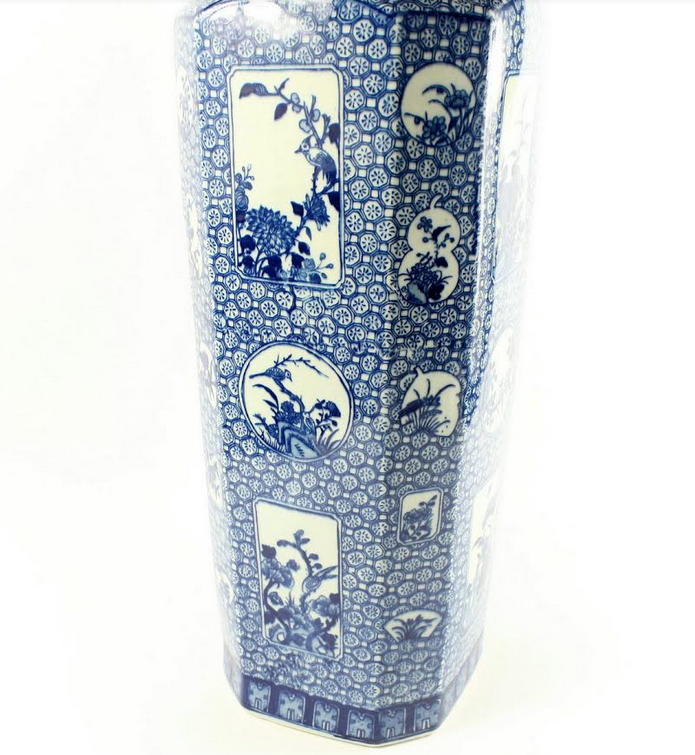 I love the jumbo double happiness vases! The large panel vase would look beautiful with fall foliage and enjoyed even more with a hot toddy! I love almost every one of them, but the plates are really pretty. Love item #21 – They are so beautiful. ! My favorite is the ice bucket/wine cooler. I love the pieces that are beautiful and functional. I would be using this one a lot! I am craving Item #14, I can picture so many rooms I could use it in. So beautiful! 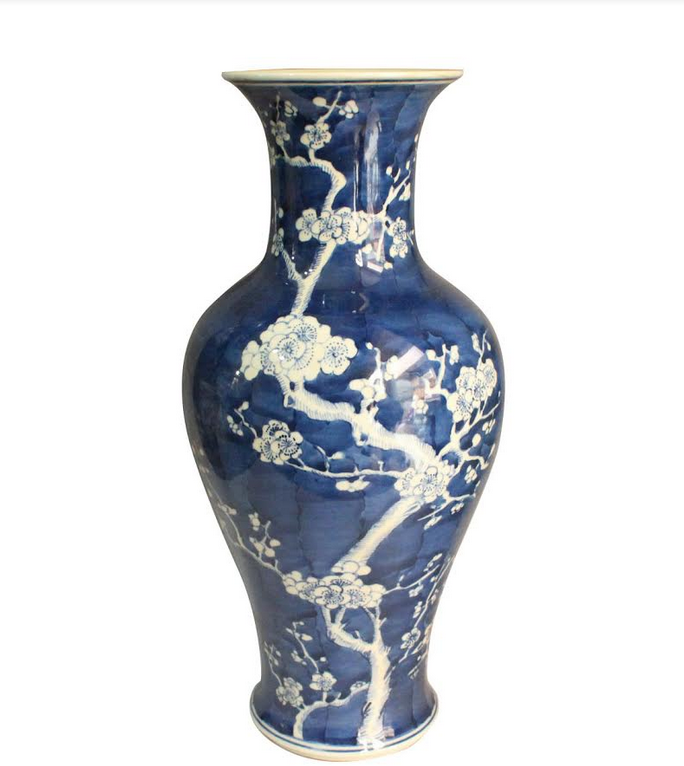 I love the cherry blossom vase! My favorite pieces are the extra large fishbowls. Would love to have them on my porch with some topiary trees or ferns. So hard to pick just one favorite, but I really like # 20, the Ginger Jar. My favorite is the ice bucket with bamboo handles. Number 10. I like the square shape to go with all my round pieces. I never tire of your beautiful selections! Great job! Am loving 17B, the oversized scalloped plate. Really speaks to me! Wonderful size for entertaining. I love #12 the flower basket design. I of course love all your items, but I especially love the wine cooler and large fish bowls. I almost ordered the Aerin wine cooler from W.S. And I’m so glad I didn’t as the one you offer is far superior and less expensive. Thank you for making such beautiful decorative items available to those people without decorators but who love design and beauty! 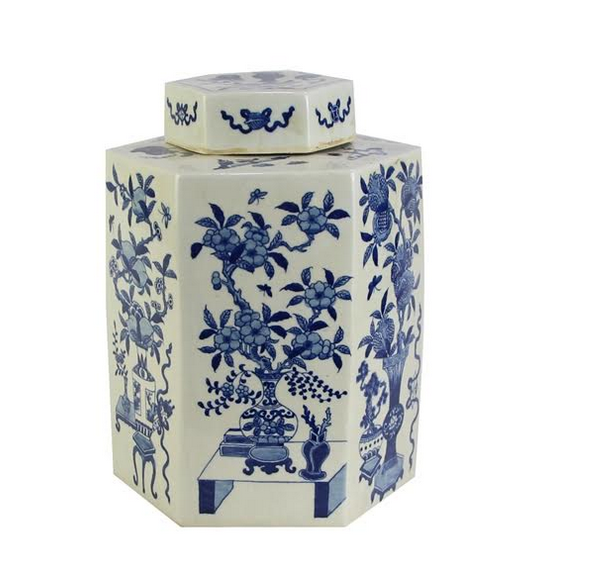 I especially love the new ginger jar with the bird trellis design! It would be a perfect addition with my other jars. I love your homes and your blog too! 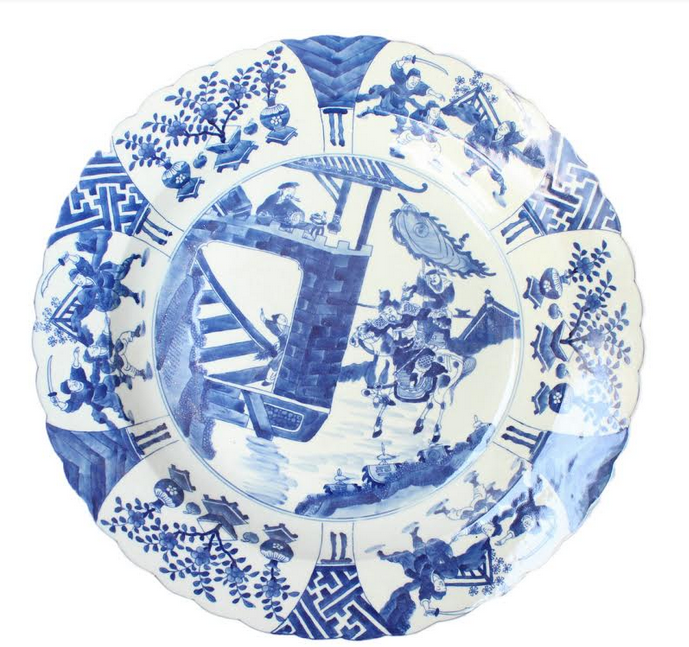 The 3 oversized porcelain plates are fabulous! My heart is beating so fast!! Love every piece: my fav is Item 20 . Fairly new collection and your suggestion that the crisp white background will lend itself to other pieces shows your experience and knowledge . This is why I love your descriptions! 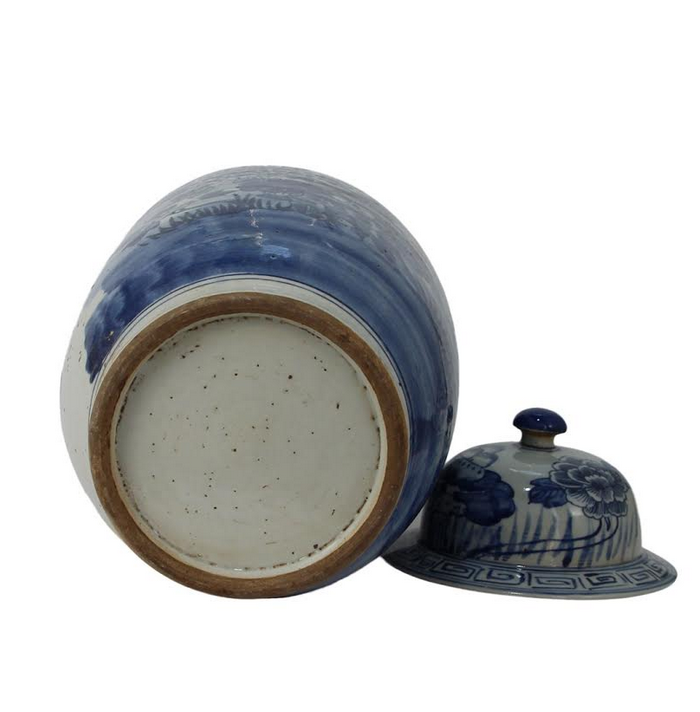 I LOVE item 21, the pheasant jar with it’s interesting hat lid. 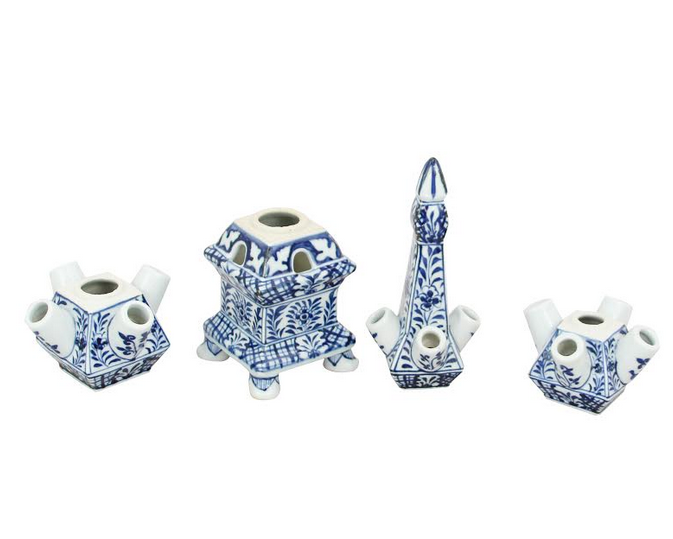 Really, you can’t go wrong with any of these new porcelains! Tina, you’ve gathered such a wonderful collection. Beautiful! WOW! Love these oh so special offerings!! The new jumbo fish bowls and those new tea jars have caught my eye!!! Thanks, Tina! Item 8. – The large Foo Dogs. All of the beautiful blue makes me so happy! 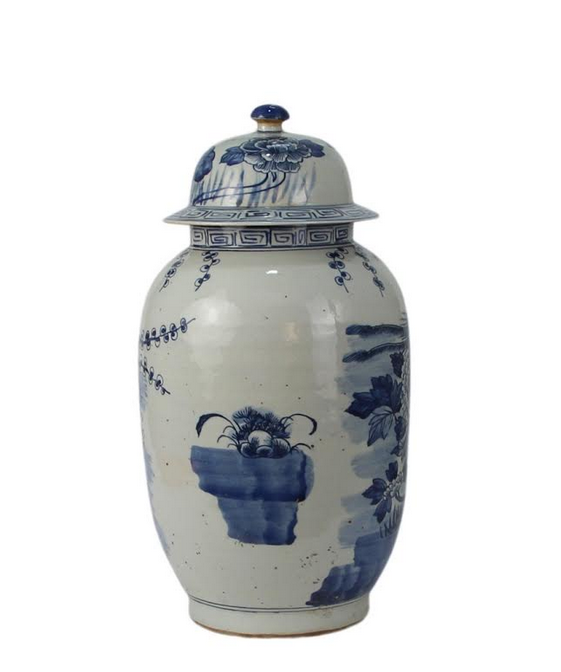 The flat top jar would look adorable in my new condo! These sales are amazing! Can’t wait to get my order! Love item 10 & 17c! That square planter! All the feels! I love it all, especially the large fish bowls, and oval platter. The ice bucket needs to join my collection. Love my blue and white! I love everything in your post, hard to choose just one. I love all the new items, it is going to be very hard to pick just one. Cannot wait to see what you have in store for Christmas. 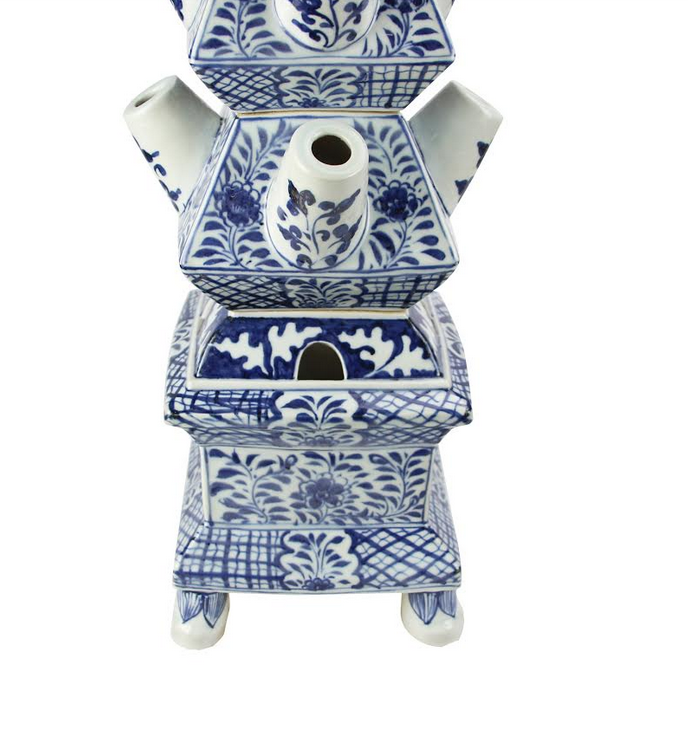 Tina, beautiful porcelain is always a great thing in any home. 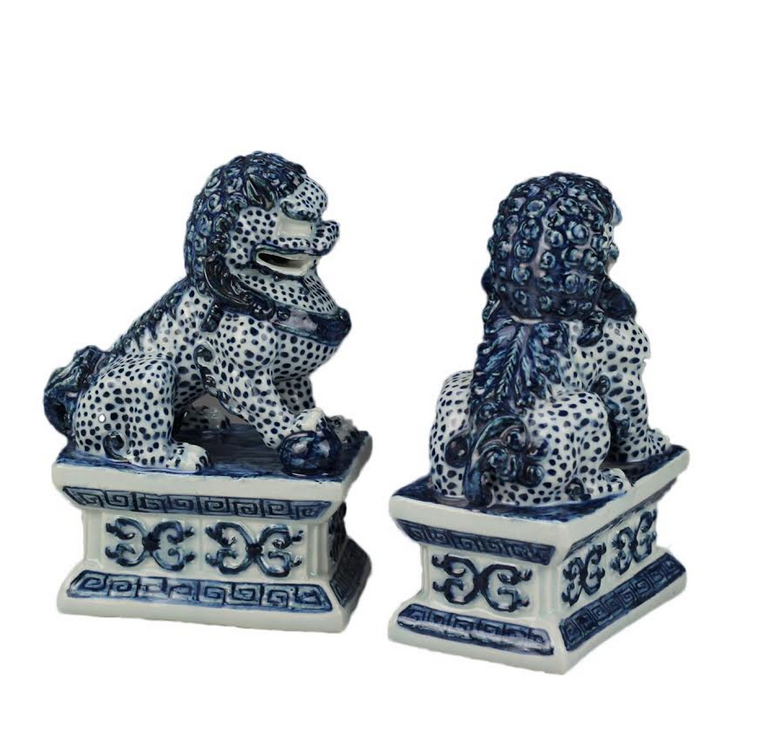 Blue and white Foo dogs forever!! I love them !! 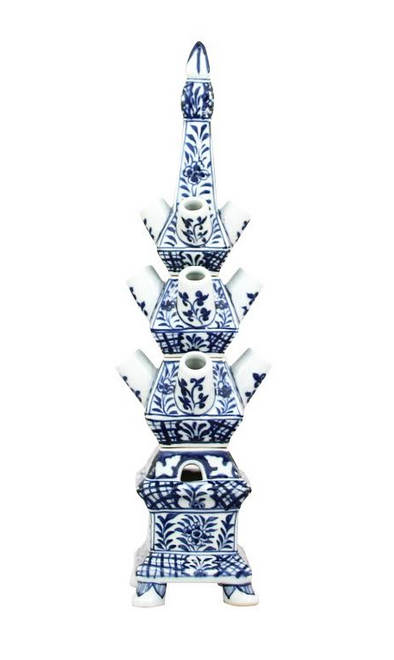 Love the double happiness jumbo vases with cobalt band for contrast. All of the pieces are lovely! I really like the new plates! Love the new cherry blossom vase and mini foo dogs. 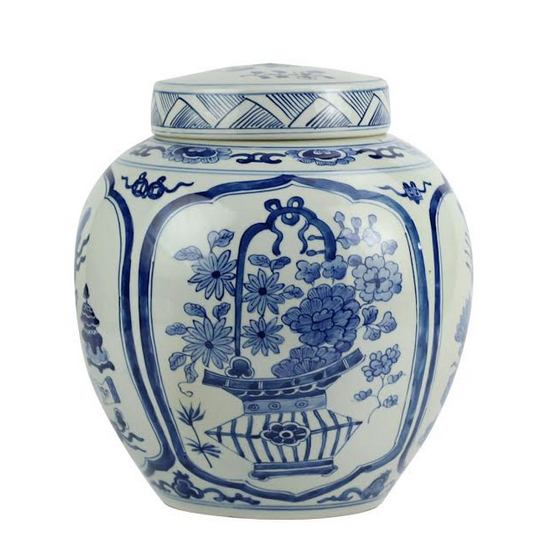 I like the cherry blossom vase, item #5. Two vases would look great on my mantel. #7 the tulipierre those are my favorite! I ordered two mediums. I will add on later. Your blog is my new obsession! Love the fishbowl and the ginger jars. My favorite is the tuliperies – they remind me of our trip to Amsterdam; I wish I had gotten one on that trip, but no way to get it home without smashing it! Hmmm – Tough choice! Item #2 or #9? I would put both to good use. Love the new tea jar! My favorite is the jumbo fishbowl! I’d love to put a fig tree in it!! Item #21 is my favorite! #14. The new large fishbowl is exquisite! Too hard to pick just one BUT if you would consider the new plates as a pair (I couldn’t just pick one…) they’re both fabulous!!! 17A and 17B!!! Love them on a dining room wall on clear acrylic brackets..or used for serving. What a presentation….I’m sure the plates would upstage the food. 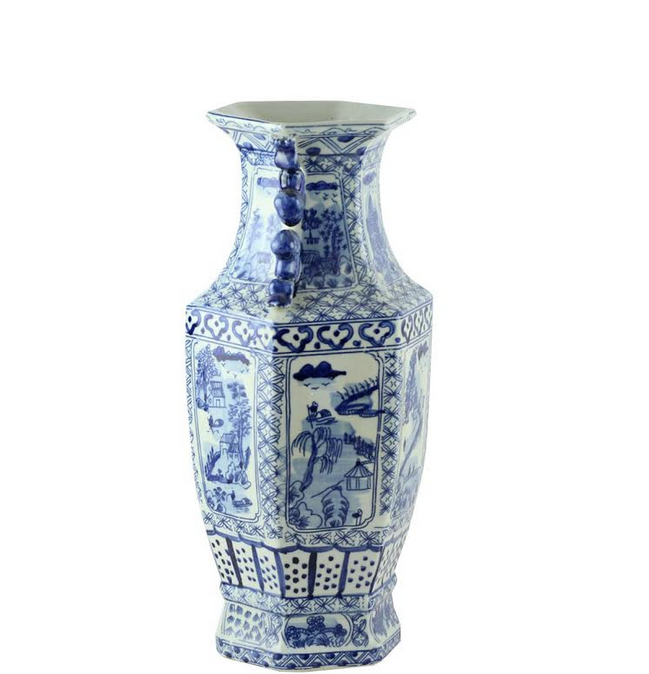 Item 20 is the perfect shape, size and balance of Blue and White! 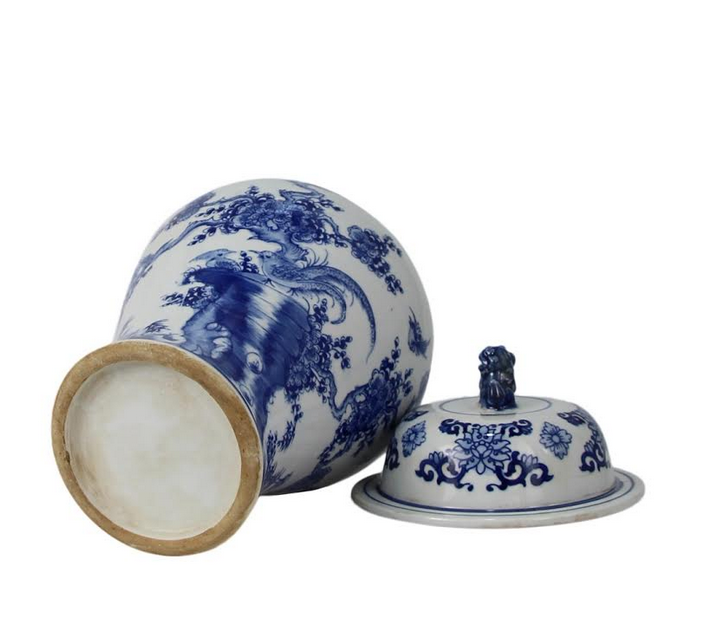 Love the Pheasant jar and the square planter, I could see the square planters on long farm tables with flowers for a Fall blue and white party. I love the new fish bowls!!! I would love to have a set of FOO Dogs. Something different to go with my jars. I am obsessed with BLUE AND WHITE! I love the ice bucket/wine cooler with the bamboo handle! 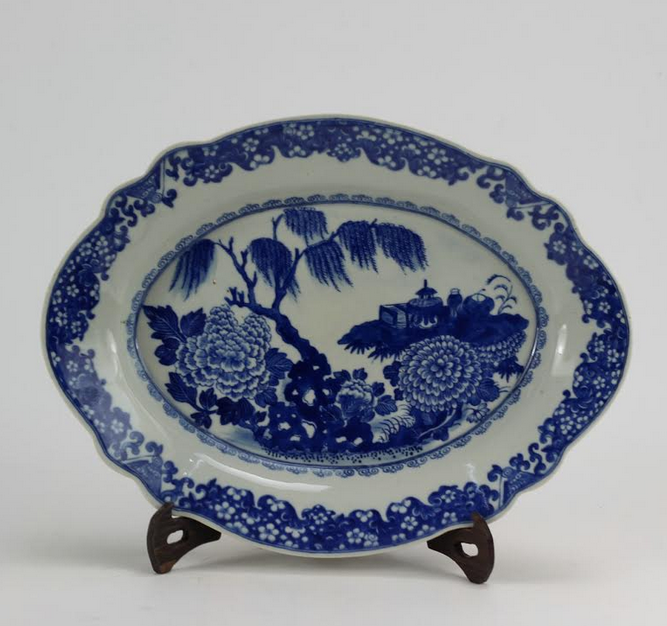 I love all your blue and white porcelain, but my favorite is #1. All of the items are beautiful. Especially like item 2 and the plates! What a great collection arriving! Love the new shaped jars and my favorite is the new large pheasant jar- beautiful shape! Too many pretty things to choose from, but have to admit am always drawn to the more ‘antique’-looking pieces, so #21, the lidded Pheasant Jar is my favorite item in this shipment. I find that these pieces look best on the antique European pine pieces in the kitchen and family room. A pair of these jars have the perfect scale for my mantle. The new plates are gorgeous!! 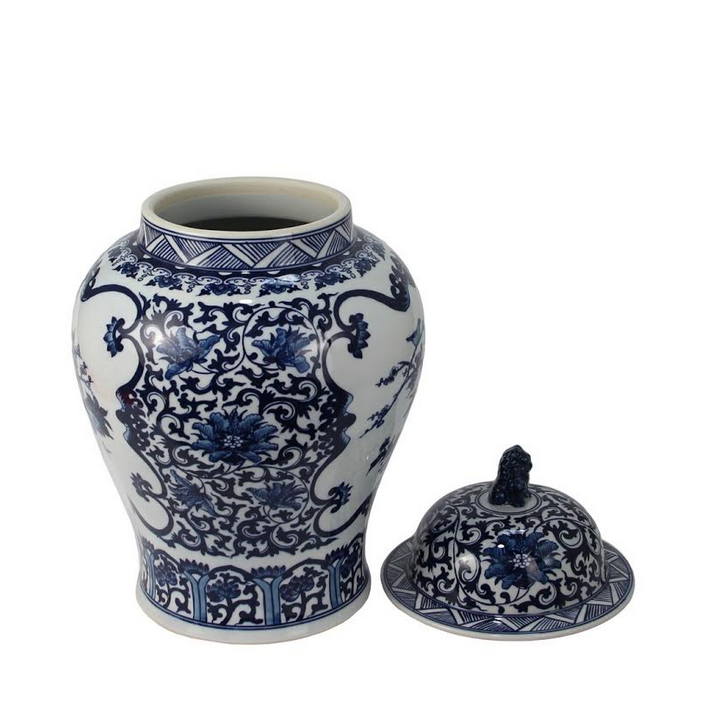 LOVE it all, but I would have to pick Ginger Jar #18- the pattern would mix great with everything else, and it would add a little darker contrast. I love everything especially the fish bowls! Look at you… saving the best for last! All are so beautiful. Have to go with #14 large fishbowl. Love the extra large fishbowl with all of the pagodas! Would fill it with champagne bottles and ice for parties! #13 is a must have. The entire collection is over the moon gorgeous! 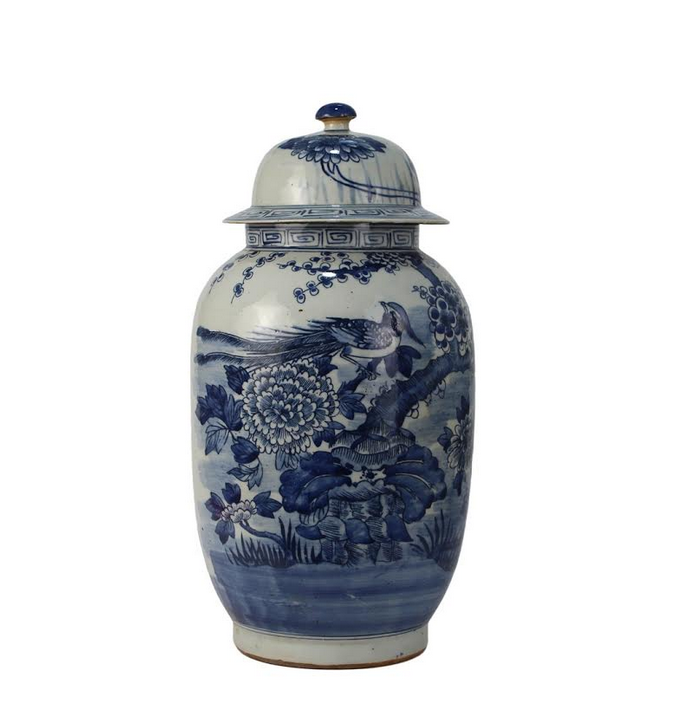 Honestly, the flat top ginger jar is my favorite!! Love #16 so much! Love Teddy too! Beautiful pieces. 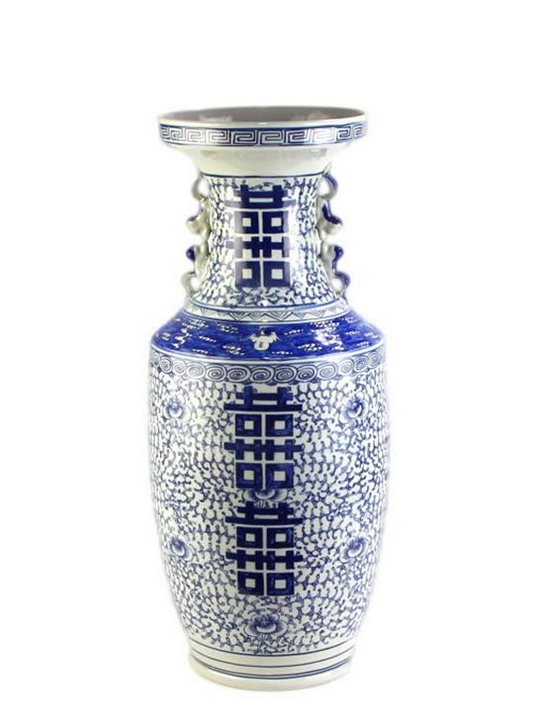 My favorite and a must buy is Item #3, the 22″ vase. I have not seen a pattern like this before and it is exactly what I have been looking for to go with coordinating pieces in my bookcases. Wow! Such pretties! My favorite is the wine cooler/ice bucket. Ooh la la! 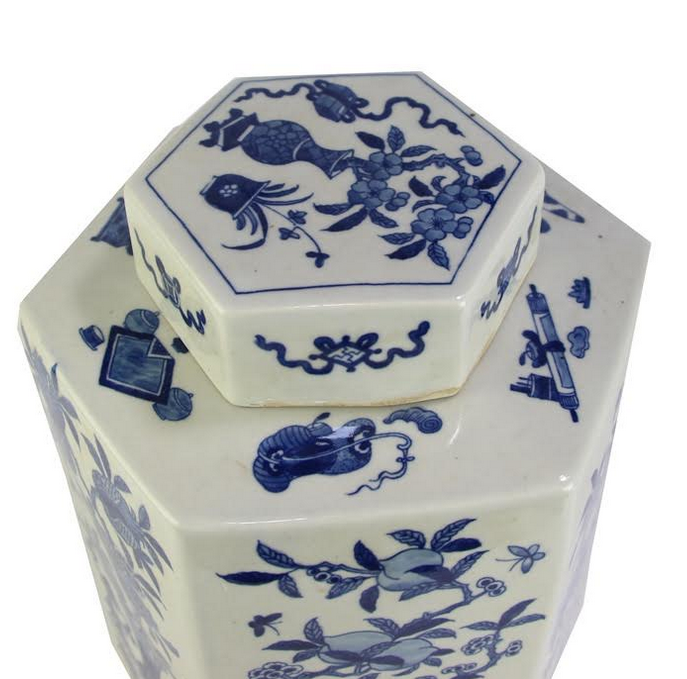 My favorite item is the mini blue and white foo dogs! I simply cannot make up my mind how to treat myself to a late birthday present. I think it is the large foo dog set. 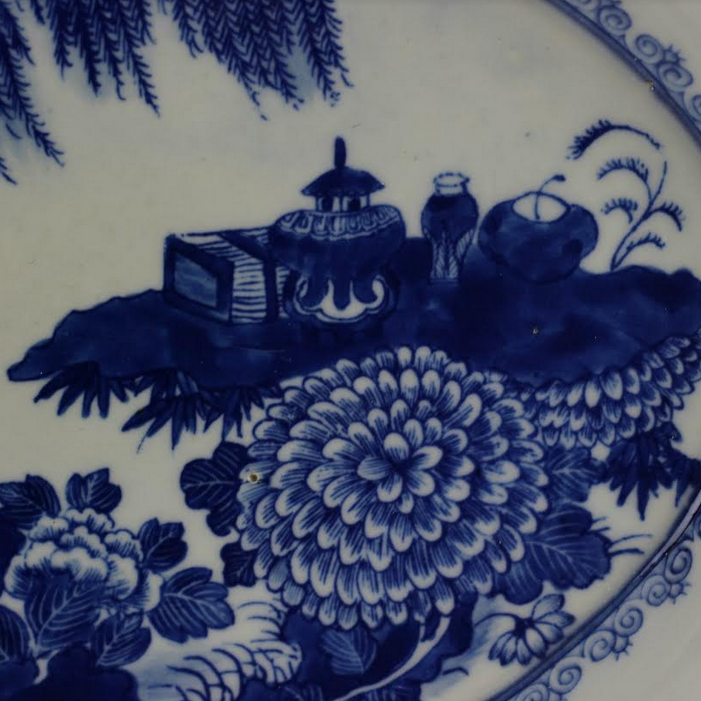 The scalloped oval platter is my favorite. It’s so pretty! Item 16 has my heart. 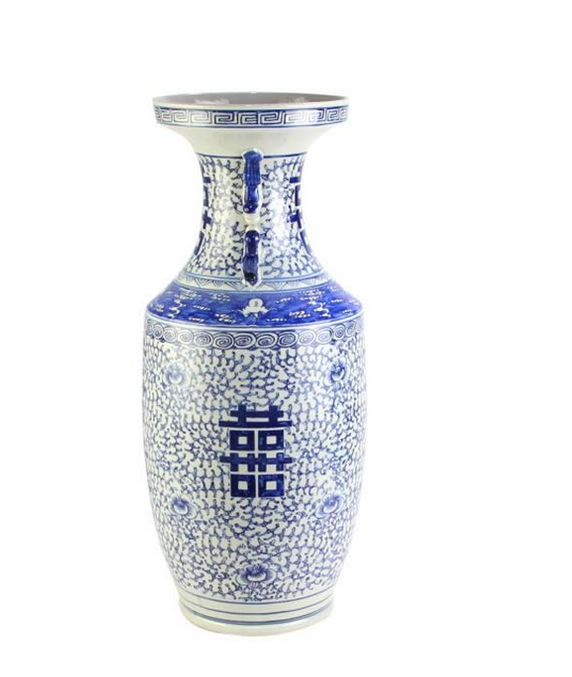 The double happiness jumbo vases are so elegant, yet very simplistic. So right for so many situations! Your pieces are my all time favorites! Always fishbowls…my favorite. Therefore Jumbo Number one. Love everything! I especially like all the ginger jars! My birthday is August 17th so the timing is wonderful, especially since we celebrate birthdays for a week! 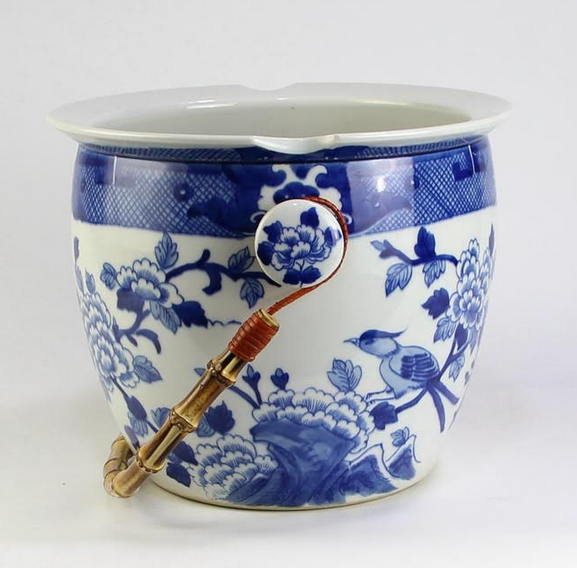 The porcelains are simply delicious art. Love your blog! Love all of it,especially the large Foo dogs and the large fish bowl. I love the stunning over sized fish bowls. So very lovely. 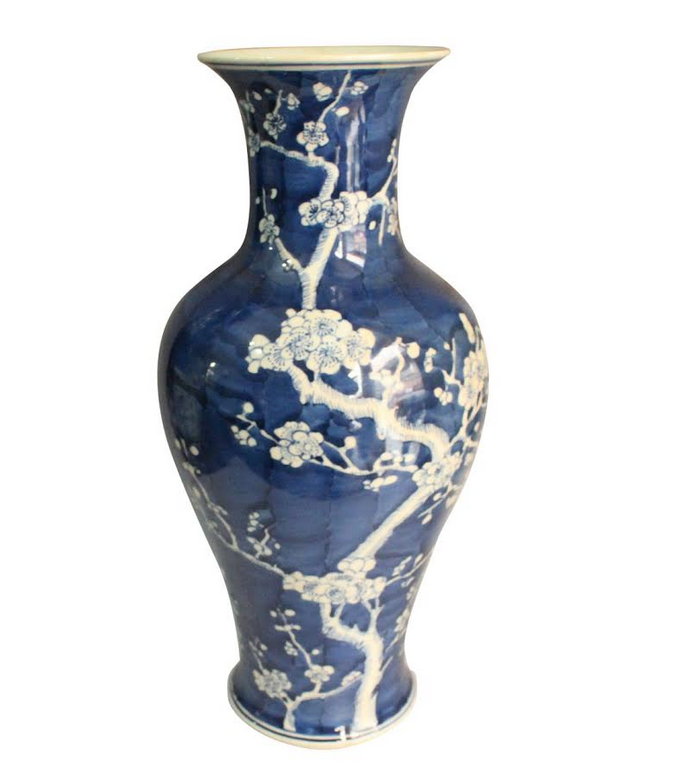 Item number 5, the cherry blossom vase! Brings back beautiful memories of DC and a wonderful time in my life ❤. I love the 17X17X18 large fish bowl with the elegant scene. This would make a beautiful home for a topiary gardenia or any other tree like plant. I love all the pieces but my favorite is #14…the shape is just gorgeous! 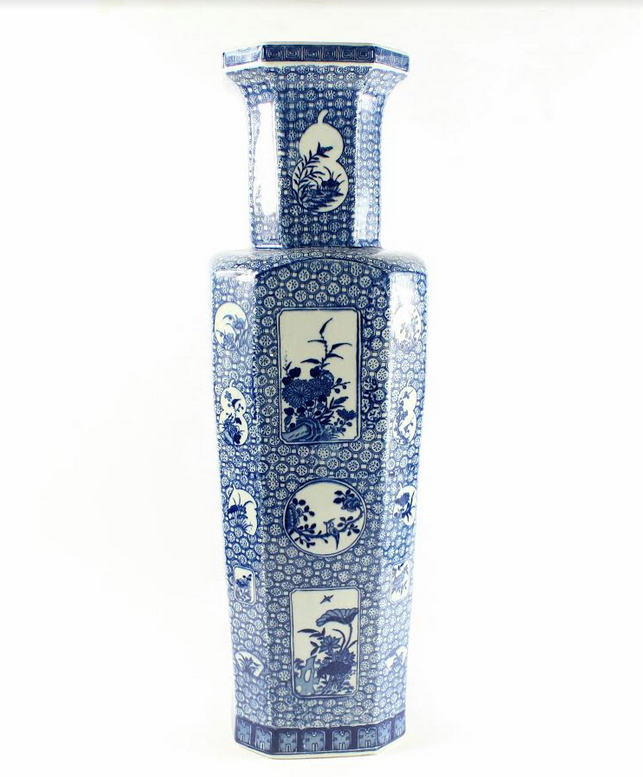 LOVE, LOVE< LOVE the 24 inch double happiness vase. What a statement those would make! 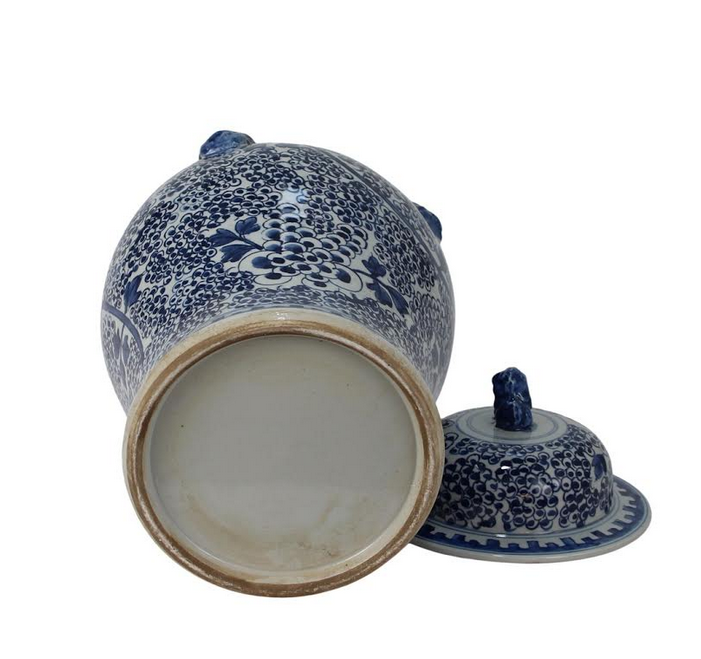 Keep coming with all the gorgeous selections of blue and white. Oh my goodness! I love it all! But the jumbo fish bowl planter is my favorite! The lion heads on either side are the perfect touch! Stunning! So hard to choose, they’re all so beautiful!!! But I especially like #13, the fruit handled vase. So many things calling my name but the smaller foo dogs and the tulipieres are on my birthday wish list. Love the cherry blossom vase! So many beautiful pieces! Who can choose just one? 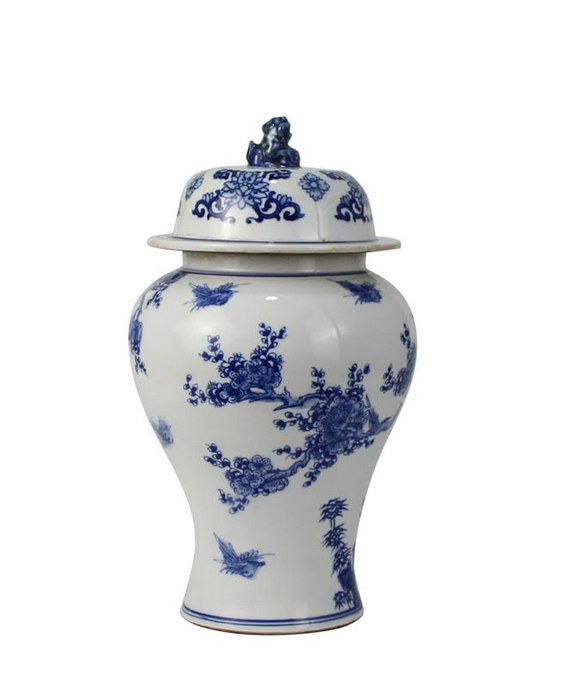 I always like the double happiness jar, it seems so classic. But there are so MANY gorgeous pieces. Honestly, I want all of them! #1 and 14 WOW! I love your new fishbowls! #15 hands down! something about this one just makes me smile!! but then again all blue and white does!!! Wow! So hard to choose. I absolutely adore no. 1, the large fishbowl. Gorgeous. I love those plates. They are gorgeous. Thank you for the giveaway. They are all beautiful pieces. 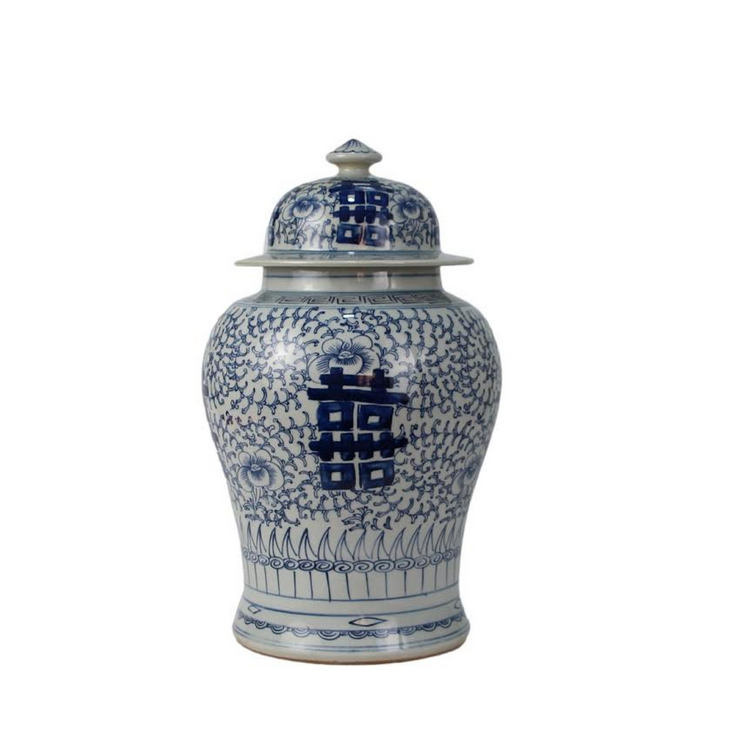 I love #20 small/medium ginger jars. I think #3 is my favorite of this round. Two of them would be gorgeous on my mantel! my favorite is the large fishbowl – beautiful! The larger bowls are gorgeous but the mid sized jars#6 and 12 speak to me too. The jumbo pheasant fishbowl is fabulous! What a lovely collection of porcelain, but the over-sized foo dogs have really caught my attention. The bamboo-handled ice bucket/cooler is my favorite!! Absolutely love the new plates. 17 a-c The oval is a beauty. Love the Pattern #12. Gorgeous! I adore the new giant fishbowls! Stunning!! All spectacular, but still in love with the ice bucket & large fish bowl!! Oh my gosh….I love the give away flat top jar! 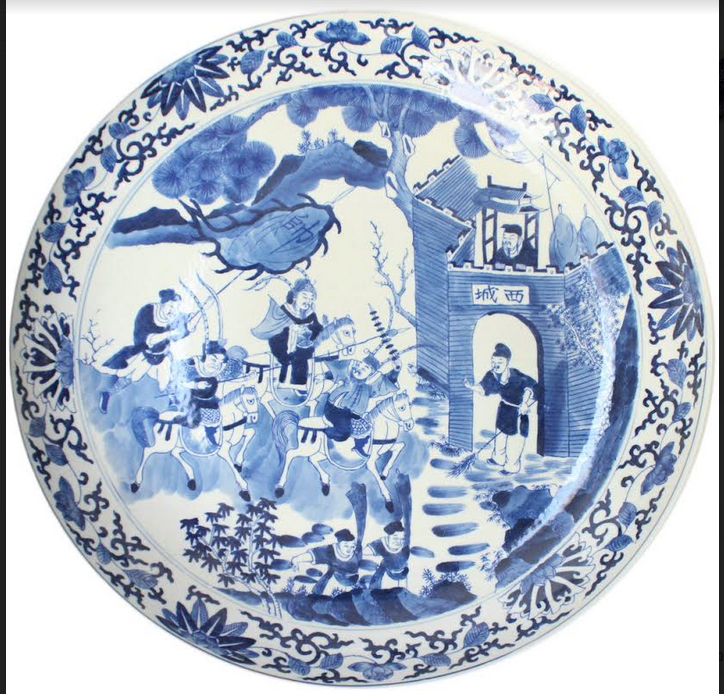 I have been painting and sketching some chinoiserie figures and those are just fabulous. Favorite thing to paint is a piece of chinoiserie with beautiful white flowers in it. I am a new fan and can’t wait to shop!!! Thank you! 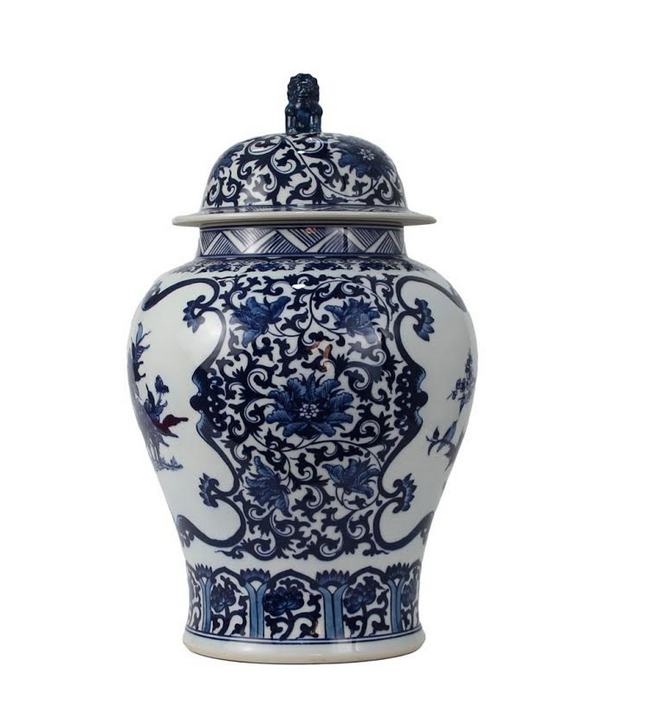 You have so many lovely pieces, but #18 is a really neat new style ginger jar! They make a unique and dramatic blue and white statement alone or as a pair. I love Item #21, your new Pheasant Jar. It will mix well with other patterns, and it has a beautiful, complementary shape. It’s a very nice addition to your offerings, Tina. My favorite is #20 but all the pieces are gorgeous!! Love number 13. Thanks for the inspiration and the comparatively great prices! You never disappoint! The wine cooler is me favorite. I’ve seen similar ones elsewhere but none with the same attention to detail. I have the large tulipierre and the small foo dogs and would buy again if I didn’t already have them. All are gorgeous. I love love no. 2. The ginger jar is gorgeous. Especially w my blue and white collection. I move my collection throughout the house. 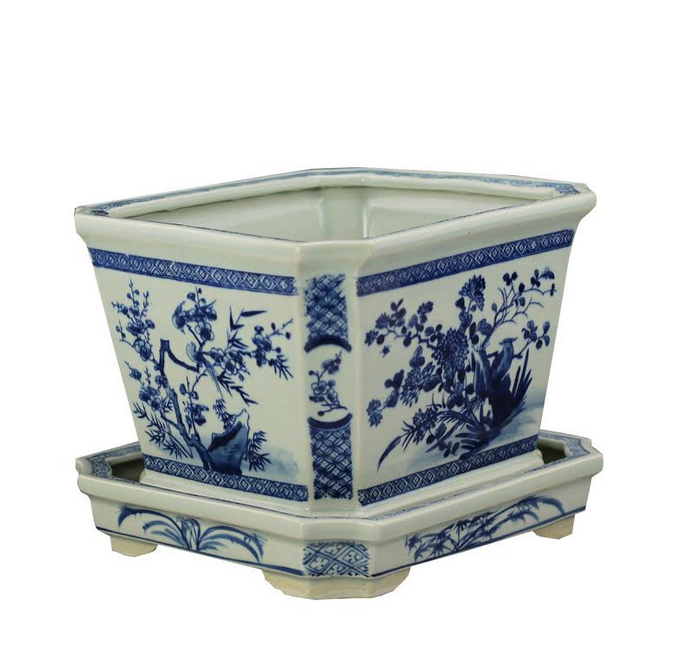 I love EVERYTHING,…….will definitely be ordering the square planters/saucers and small foo dogs for gifts….. can be placed in so many places: side tables, powder room, etc. Love all of the blue and white! 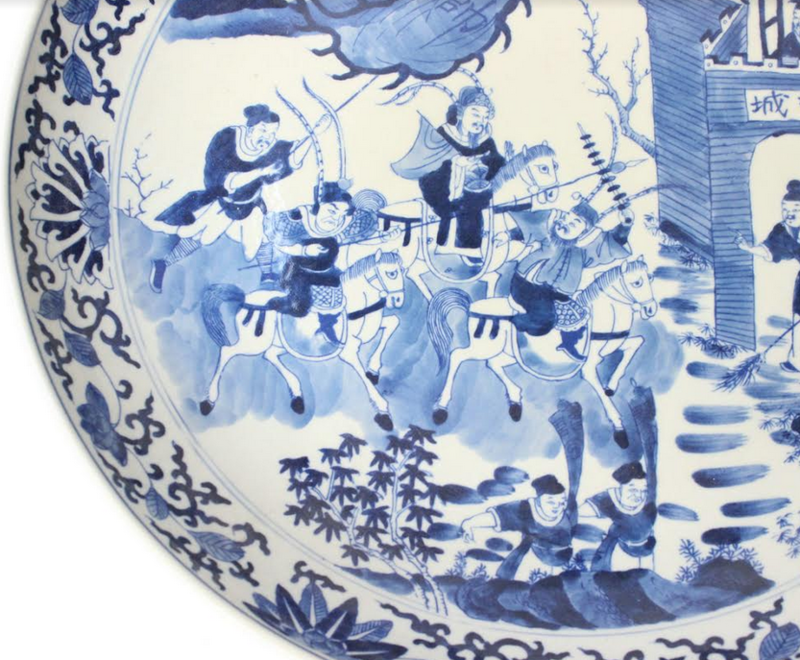 My favorite is #1, the impressively-sized fishbowl with the lion handles and vibrantly colored village scene! They’re all beautiful, but item #4 is stunning! Love anything with birds! Item 7, The Tulipieres are my next addition to my growing collection. 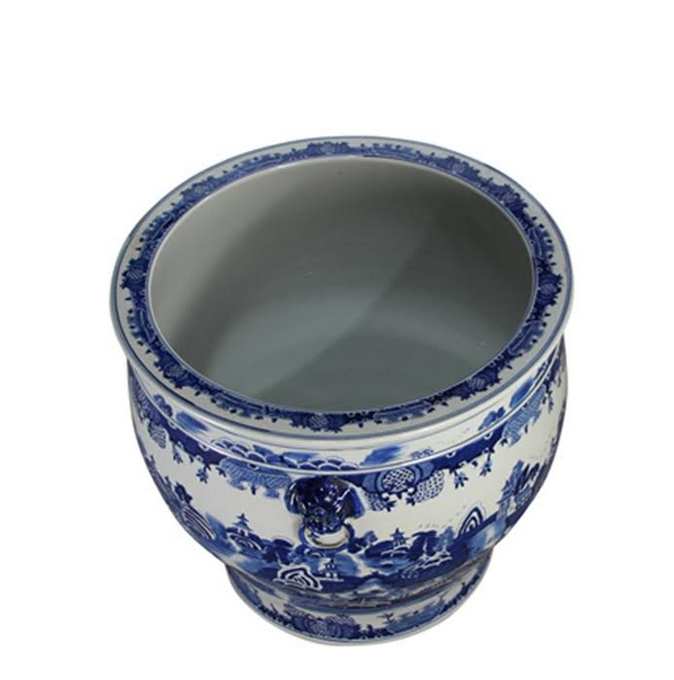 I love all the sizes and would fill them with beautiful flowers. They are a statement piece all by themselves. Thanks for sharing all the new collection. Have a great day. So hard to make a decision; but the plates are lovely! Can’t decide which one to get! I am excited to see the jumbo fishbowl. Perfect for around the pool! 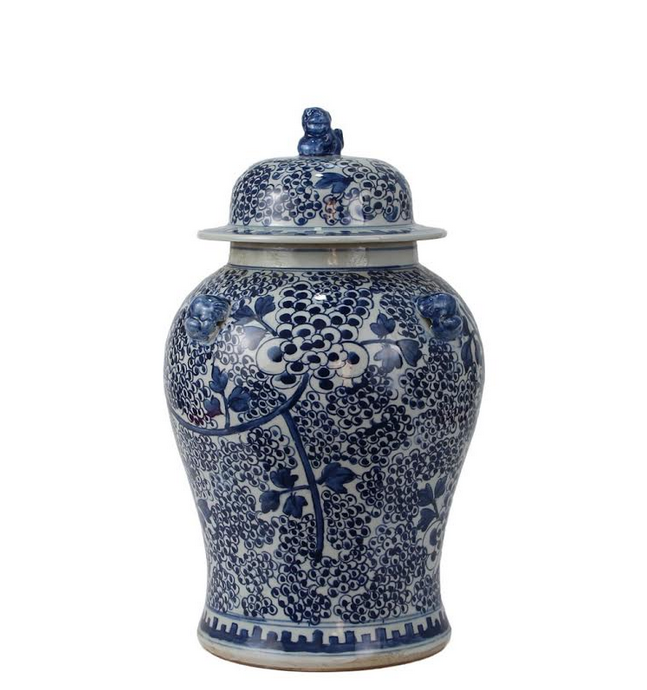 Love all the beautiful pieces, especially the new ginger jars! #21 is my favorite! Gorgeous! 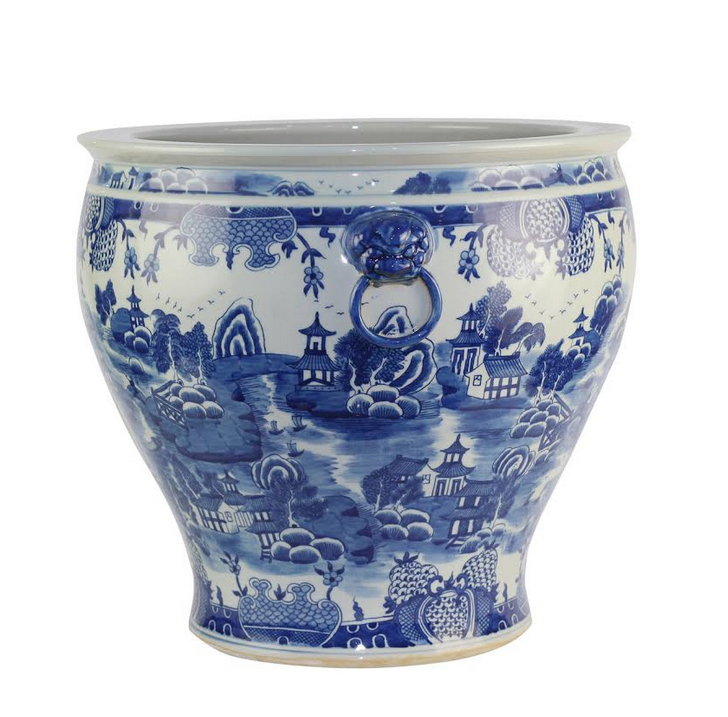 My new favorite is #14, the fishbowl with the village scene and handle detail! Wow! Those fish bowls are amazing… all of them. Fabulous pices! I love the classic tulipiere, they are beautiful and timeless! #21 is my favorite! So eye catching! Pattern is beautiful! 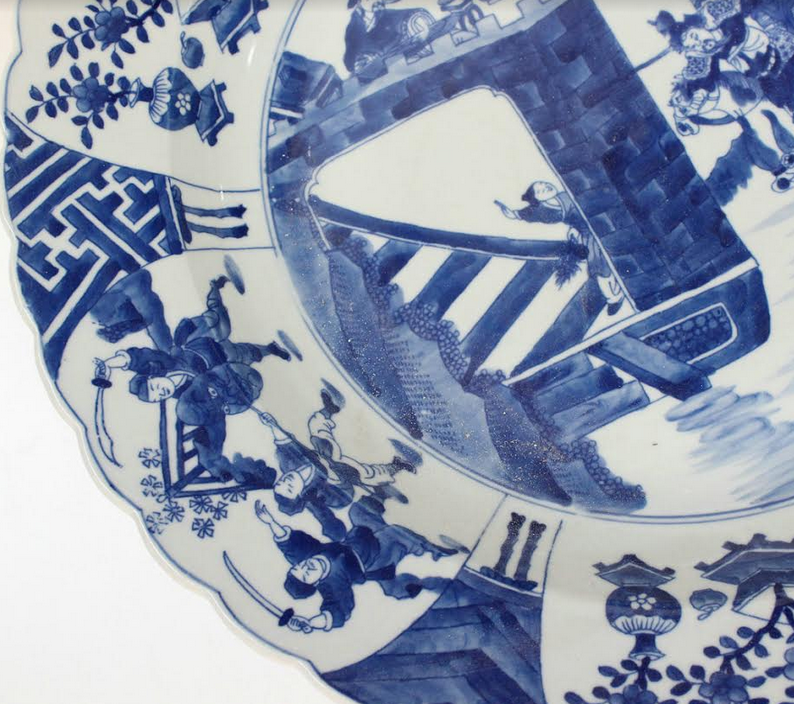 Love all the porcelain ! Color me BLUE! 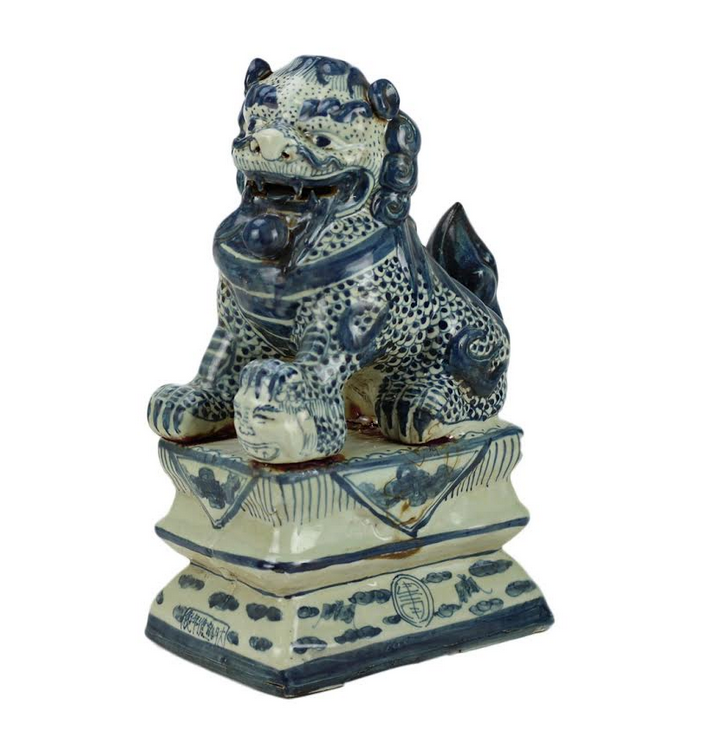 All of it really but if we have to choose…large foo dogs and the extra large planters. Whoa, AMAZING! 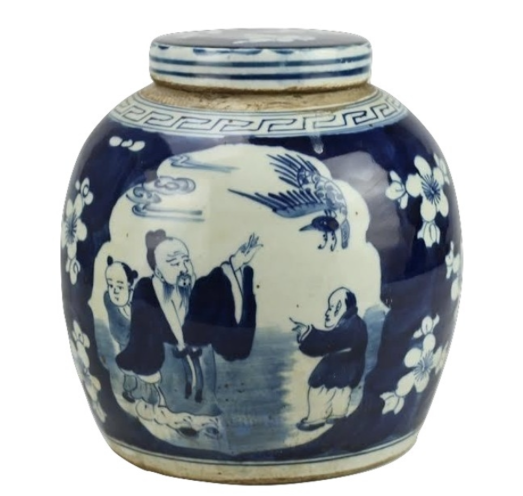 Love #20, Ginger Jar with the bird and floral. Just eye candy for me ! #2 ginger jar with bird trellis! Waiting patiently for my ice bucket and love the Fish Bowl. Need to order it now. I think my favorite is the mini foo dogs. How cute. The first fishbowl is beautiful! 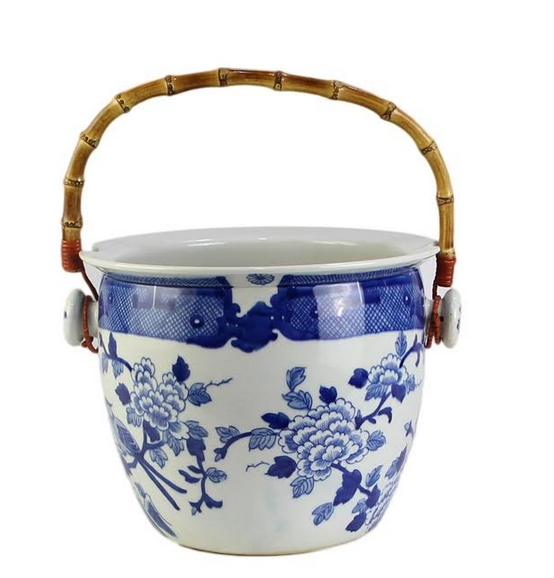 Love the ice bucket with rattan handles. And love the give away jar! Oh my!!! So hard to choose just one fav thing!! It’ll have to be the wine bucket with the bamboo handle!! So completely unusual and different!! 💙💙💙 it!!!!! I just am so elated about the pheasant jar. They are stunners on a mantle. Thanks for the wonderful selection of blue and white. Tina, what a fabulous collection you have brought to us. Bravo ! 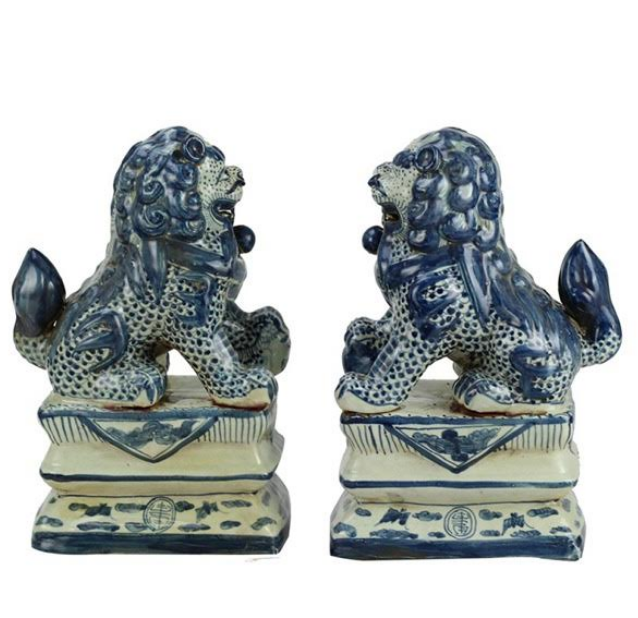 Love the large blue and white foo dogs. Have just the place for them on my living room console. Also, the large plates are just grand. So beautiful. Thanks for making so many decorating possibilities available to your clients. So many beautiful pieces!! Love them all but my favorite is item #2. 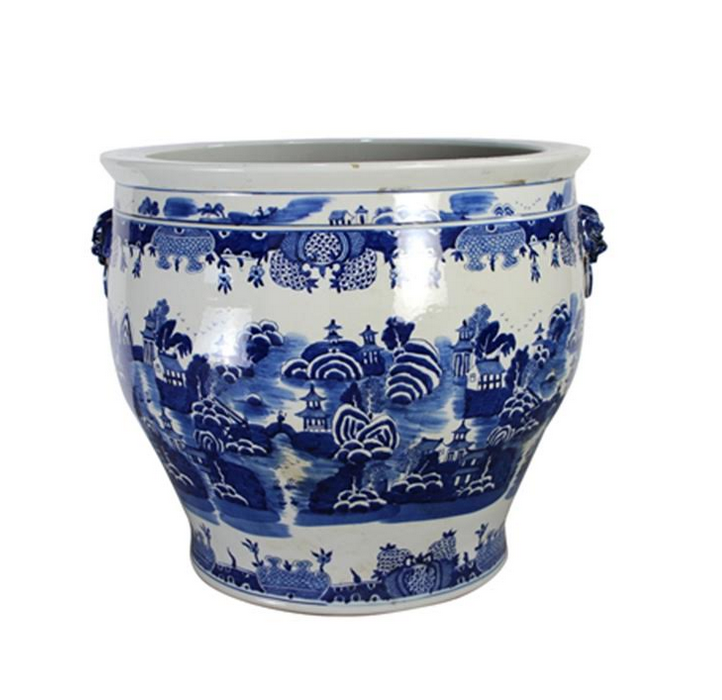 The pheasant large fishbowl planter is just gorgeous!!! I can see it flanking an entry beautifully! I love it all.. but just ordered #21 for our cabin!! Love the wine bucket! So different and useful! So in LOVE with the fishbowl planter and boxwood!! 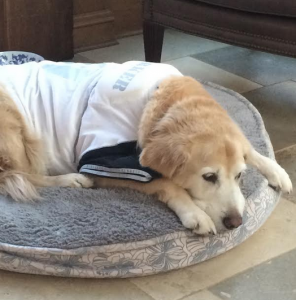 That being said, there is so much more blue and white here to love…as always! I do not see the faux boxwood balls on this site…r they still available? The foo dogs make me smile! The fish bowls are spectacular. The giant fishbowl is wonderful and so many things you can do with it, Glass top as side table on a stand; hold a beautiful plant; in the fireplace with dried hydrangeas; so many optional! I love item 19 the foo dogs. Would add just the right touch as bookends in my family room built-in bookcase. Fishbowls all the way!!!! Gorg!! 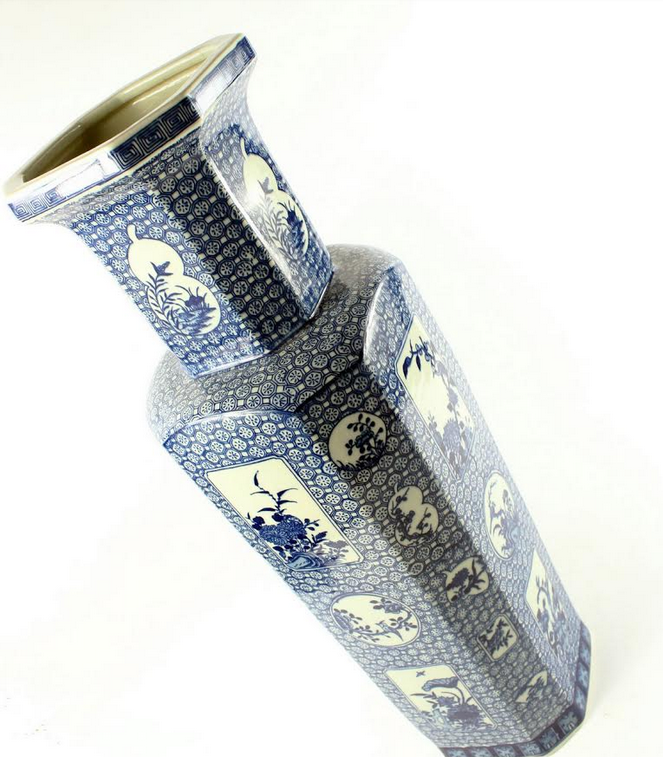 Love # 16, the double happiness vase. Great height for a stunning look. Love #14, the new shape fish bowl. Dramatic and special with the different curve. 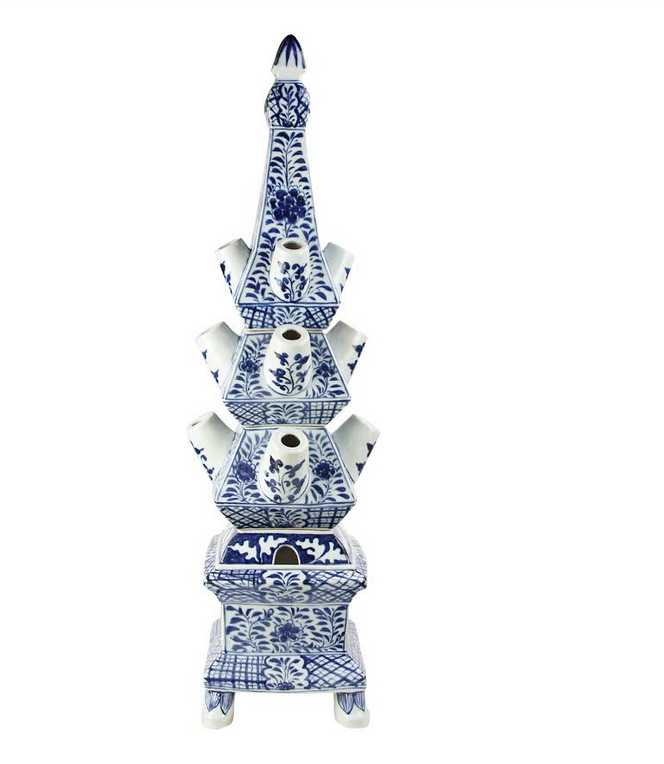 Such a great collection of blue and white pieces to choose from! I always love the fish bowls and these extra large ones are beautiful! I also like the large plates and the tea jar but my favorite from this group is the new cherry blossom vase – looking forward to seeing it in my home! I love the large pheasant fish bowl. So many beautiful new pieces! Your giant fishbowls are out of this world! Everything looks beautiful! My favorites are #9 and #20! The new, large fishbowls are beautiful. I also love the new panel vase…#3. So many great choices!! 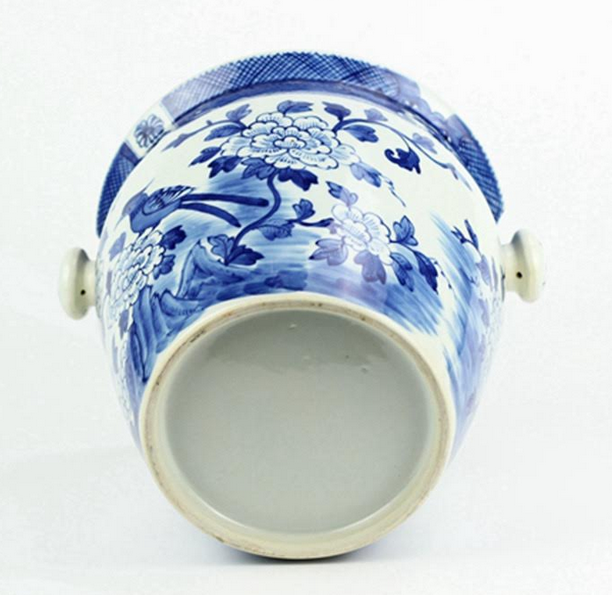 Love Item #9, the porcelain wine cooler! I also like the fact that the handle is removable. What beautiful blue and whites to choose from. 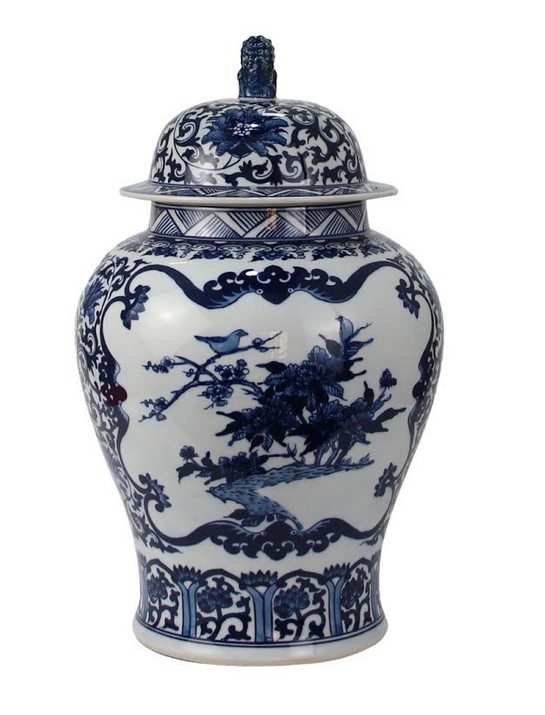 The last pheasant jar is stunning! Love it all but hoping I the tulipierre is what I covet because I don’t have one…yet. I am over the moon for the pheasant jar! REALLY TINA! How am I expected to chose a favorite from this absolutely magnificent selection of Blue and White!! I adore every piece in this presale and want everyone of them! NO, I take that back…TWO! Seriously,…I definitely agree with you and think that ITEM 2 might be a new favorite ginger jar of mine as well. It is stunning and in my humble opinion will be a best seller! I love the first fishbowl in the list. Stunning!! 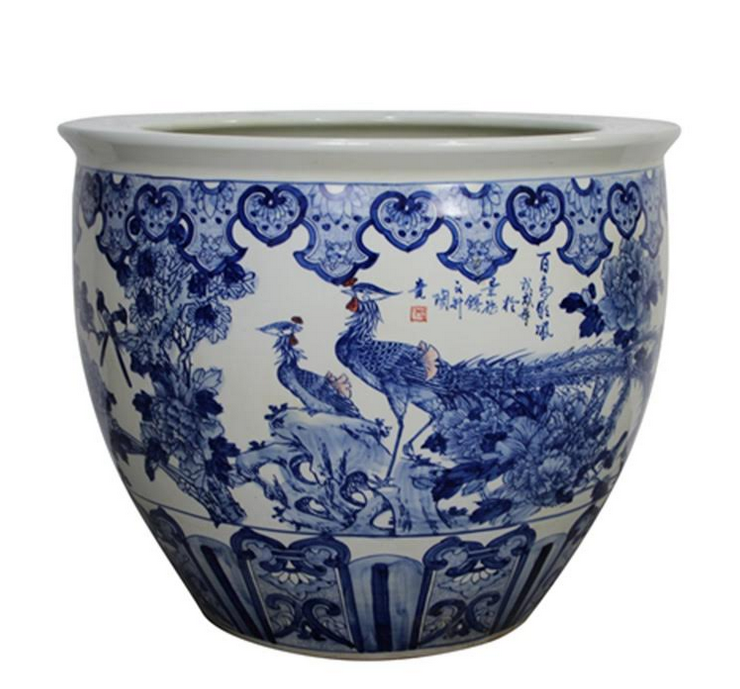 I love the new pheasant fish bowl (#4) and the new style ginger jar with the foo dog lid (#18)! Of course, everything you offer is Beautiful!! the pheasant fishbowl is EVERYTHING!!!!!!!!!!!!!!!! I love the hexagon shape of #6. the most although I would love to have any to the pieces. I love the foo dogs!!! 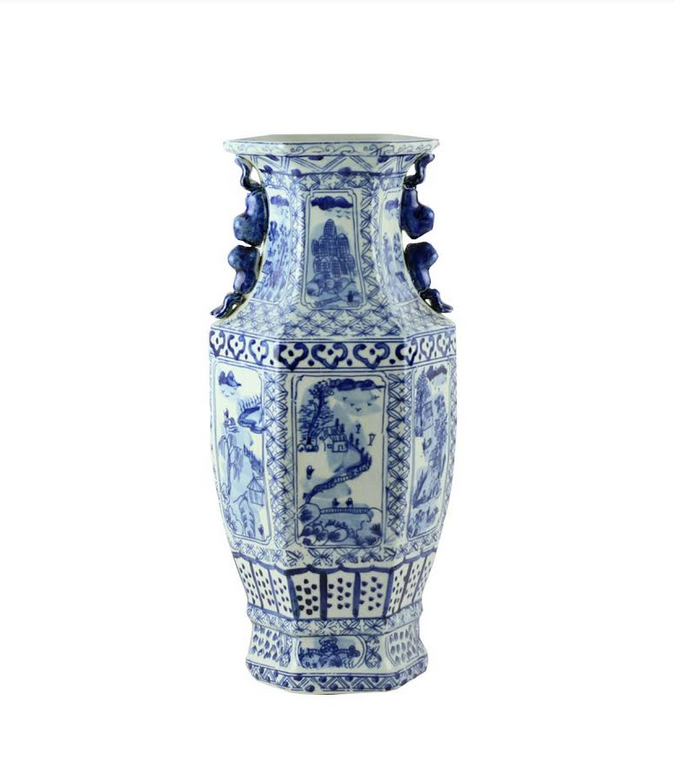 I have to say that Item #9 is my favorite of the moment as it combines the beauty and timeless appeal of blue and white with modern practicality. I can absolutely see it in use at my Thanksgiving and Holiday parties as well as at my gal pal get-togethers. He’s practically screaming my name… he really does want to come live with me so very badly. Please don’t disappoint this handsome fellow. He tends to pout. I love item 6…the covered ginger jar! Everything is just beautiful, but I have a weakness for any ginger jar. They just speak to my heart. #20 is fabulous! I love it all , too… but I love the ice bucket with bamboo handle! I love them all but can’t wait to use 17c it’s gorgeous and will look great in my kitchen! 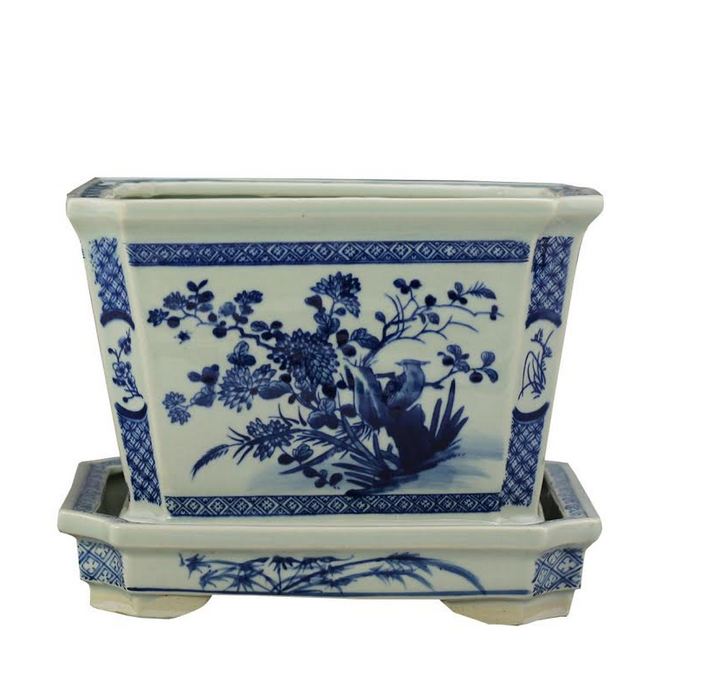 I really love the square planter with the plate!! I can just see it holding so many different plants! I love, love, love the ice bucket with removable handle! !